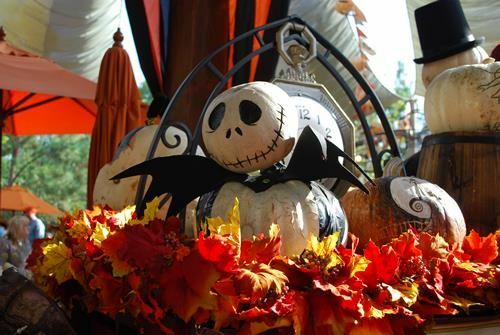 HalloweenTime is one of my favorite times of the year at the Disneyland Resort (well, any time at Disneyland is a great time!). 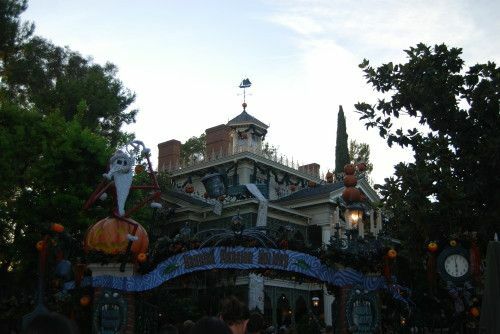 I've been going pretty regularly since 2011 and been posting my photos (and reports) from Mickey's Halloween Party, Haunted Mansion Holiday, and HalloweenTime in general in the HalloweenTime SuperThreads. 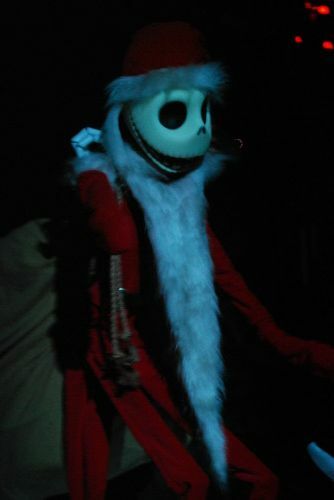 I recently had to re-organize my Photobucket account, which meant the photos were lost from those posts. So it seemed like a good chance to consolidate the reports and re-post them in their own (on-going) trip report thread! 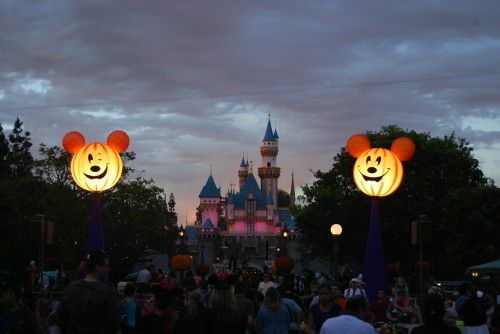 My family and I went to Disneyland during Halloween time for the first time in a while. We had a lot of fun! I thought I'd share some of the photos I took during our visist. 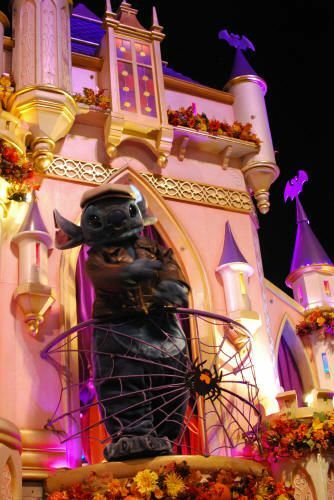 We attended the first Mickey's Halloween Party. 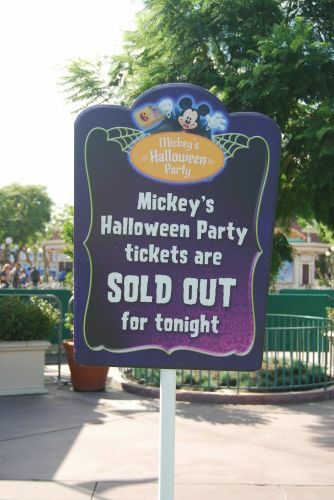 As we walked to the ticket gates, among the first things we saw was a sign saying the party was sold out! 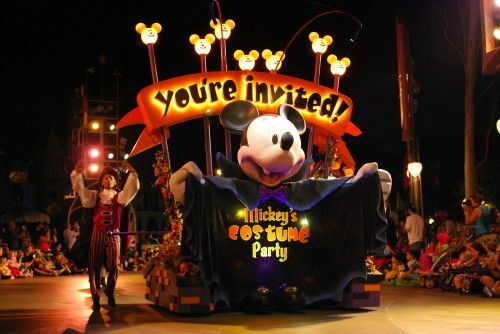 I have to say, we were expected huge crowds at the party because it was sold out. 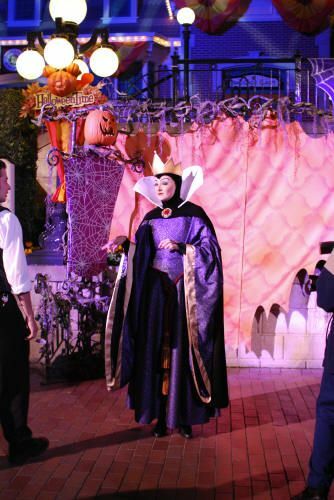 We even talked with some cast members (the next day) and they were saying the party ended up being over sold. As it turned out, the crowds seemed pretty manageable (to us). Anyway, more on the party later. 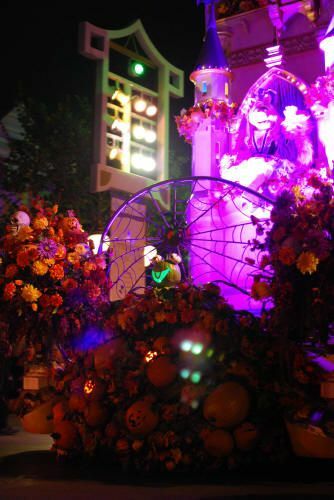 There were many Halloween themed decorations along Main Street. 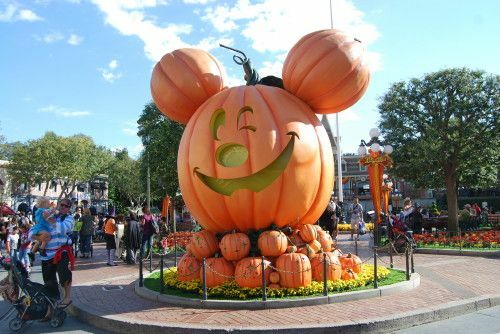 Giant Mickey head pumpkin in town square. 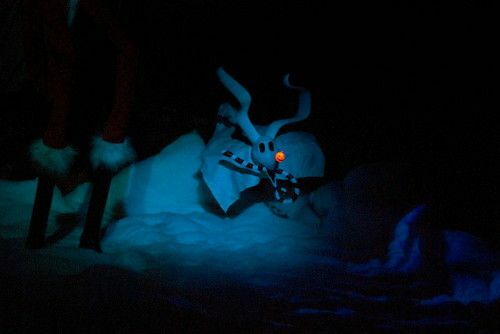 There were photopass photographers taking pictures, so I had to wait until they were transitioning from one group to the next to get a pictures without anyone in front! 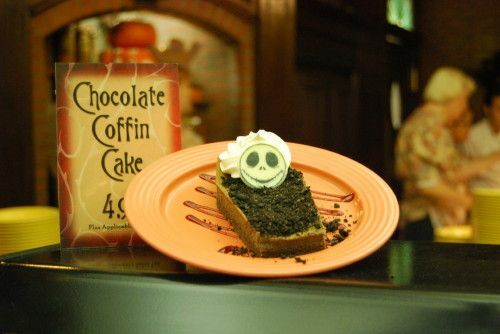 There were also a lot of special Halloween themed foods. 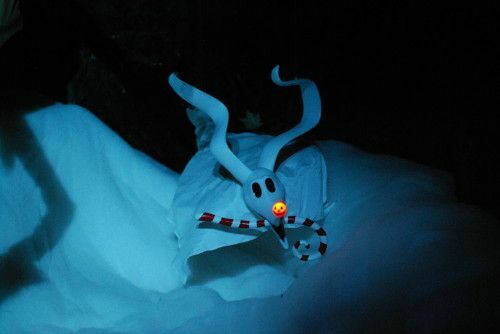 We didn't try to many of them, but really wanted the Mickey and Donald pumpkin cups and the Nightmare Before Christmas popcorn/muffaletta container. We had lunch at French Market to get the muffaletta. The sandwhich was really good (we had a second one the next day). 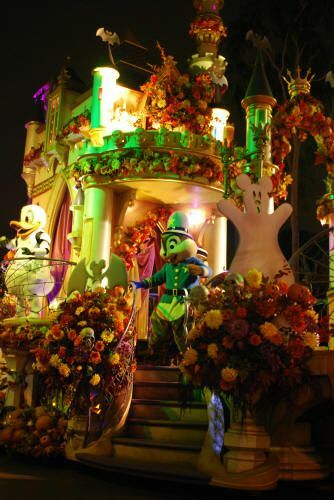 We got the Mickey demitasse at Carnations and the Donald demitasse at the Plaza Inn. 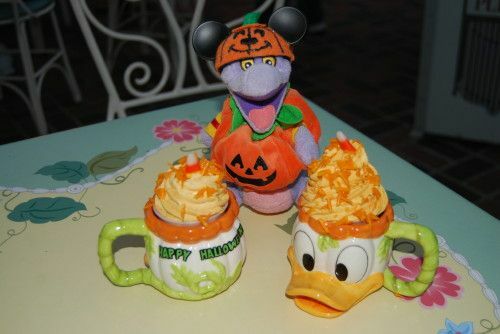 The pumpkin mousse wasn't as strongly pumpkin as I had expected, but I liked the tiramisu and apple spice muffin parts of the dessert better. 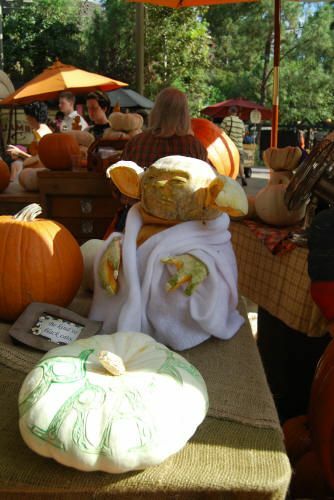 The French Market also had a special Nightmare dessert. 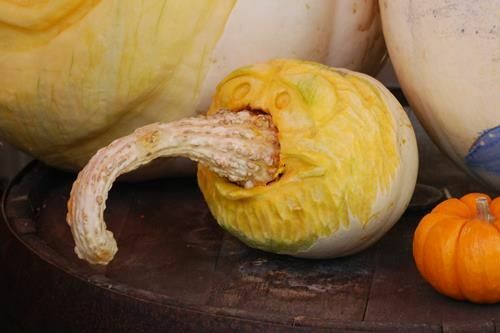 It looked good, but we didn't have one. 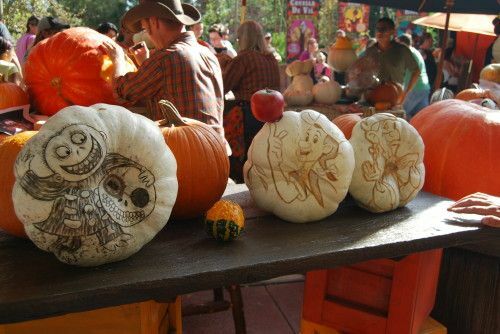 Back at Big Thunder Ranch, they were carving pumpkins. 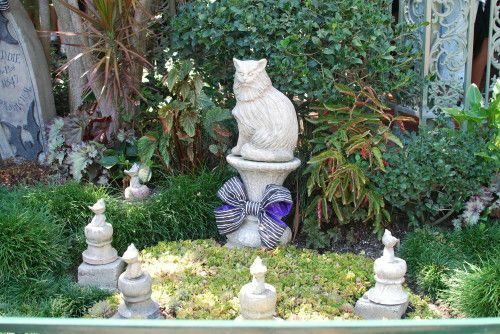 There were several cute ones. 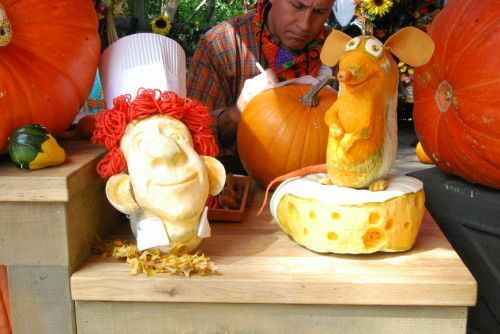 My favorites were the Linguini and Remy pumpkins (we saw them in the process of carving Remy on Sunday and then the finished one on Monday) and the Toy Story Alien. 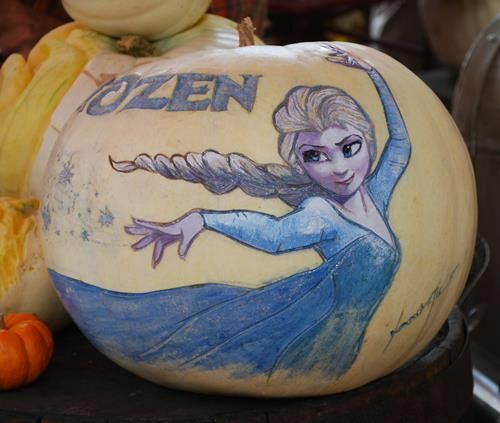 Overall the pumpkins were pretty impressive. And now on to the party itself! 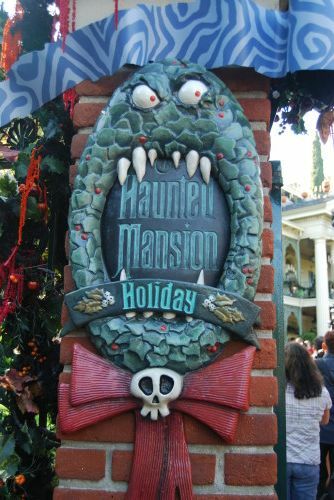 We got to Disneyland about 2:30 pm (on Friday, 9/30), so we had time to see Haunted Mansion Holiday and get a late lunch before the party started. 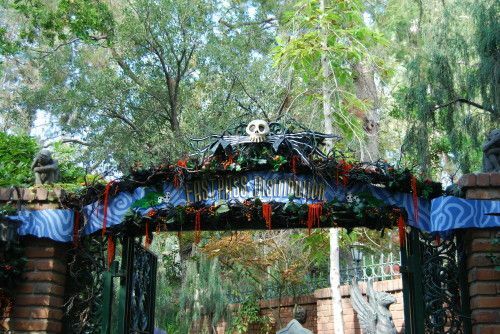 I asked a CM at the front gate if we needed to come back to the front to get our party wristbands or if there was a place inside the park. He said we had to come back to the front. 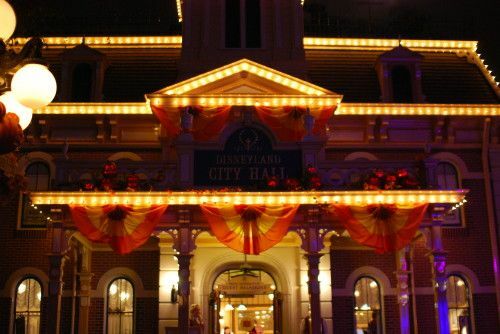 We ended up having to exit the park and then come back in using our party tickets. 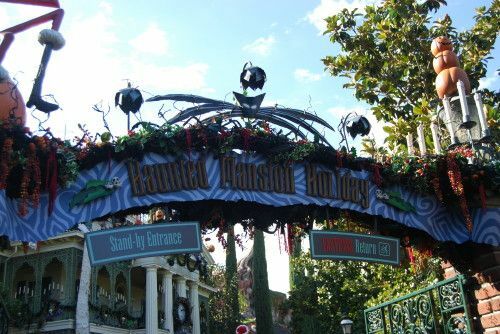 Several of the turnstiles had been designated party only. It close to 5:30 pm or so when we did this, so the line wasn't to bad. 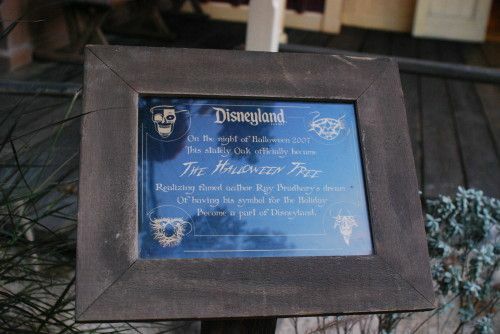 By Monday, I saw a sign saying there was a ticket activation location inside the park. 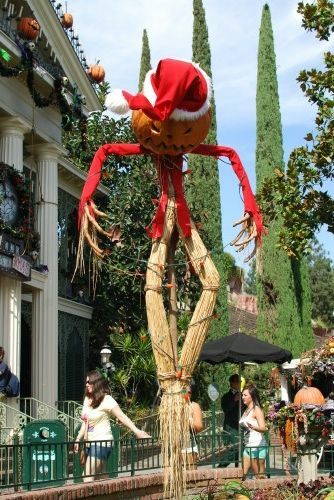 By this point, several of the decorations were already up or being set up. 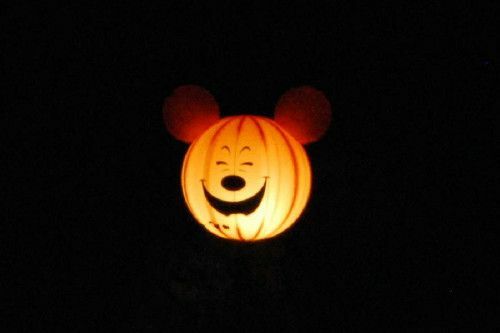 There were pumpkin Mickey heads set up around the hub and several of the White ghost Mickeys throughout the park. 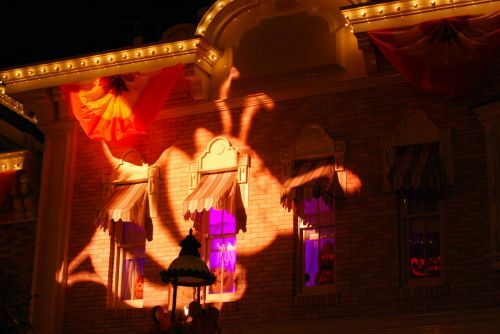 In tomorrowland, there was a Ghost Mickey with bats being projected behind it. 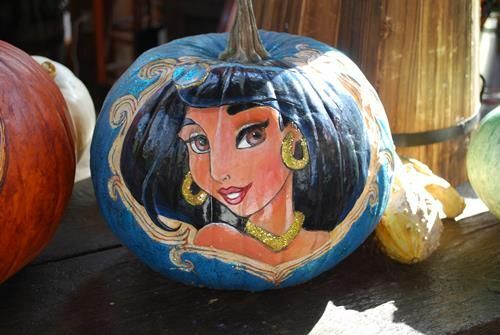 This was one of my favorites! 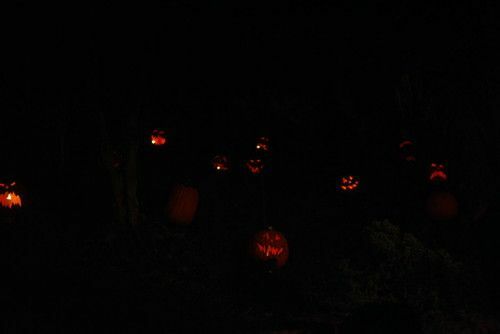 The lines for the treat stations were pretty long at the start of the party, so we decided to forego them until later. 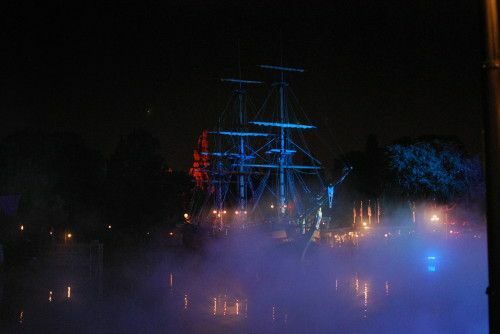 The Rivers of America had a lot of "fog" (dry ice) on it, making the Columbia look really spooky. 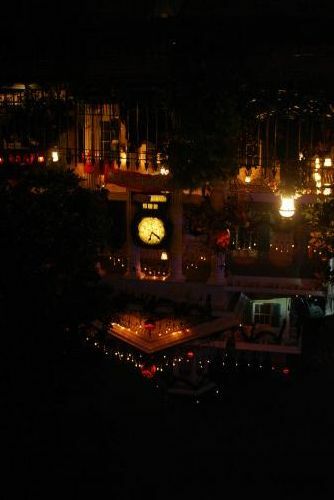 At 7 pm, the CM began to herd the non-party guests from the park. 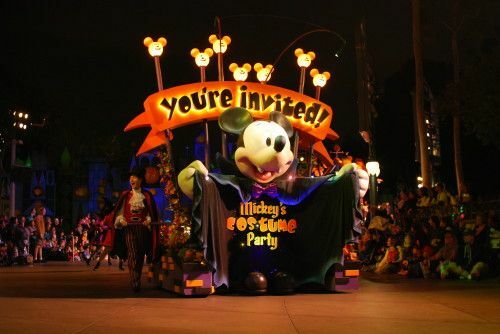 Along most of the major walkways, there were several CM holding signs for the party preventing guests from heading deeper into the park. 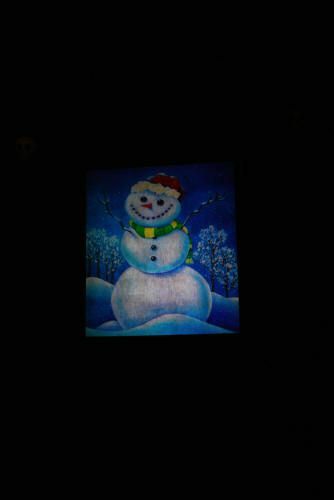 The signs were cute. They closed most of the doors to the stores or left them open, but with a CM there checking for wristbands. You needed to show the band to get into the stores or beyond the check points. I saw them checking for wristbands up until around 8:15 pm. 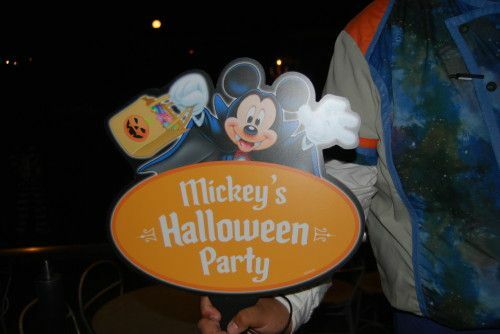 This was the sign held by CMs preventing non-party guests from going deeper into the park. 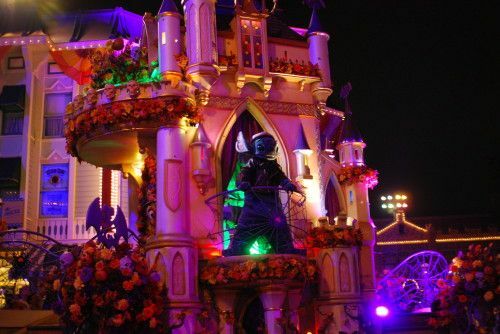 We decided to watch the Cavalcade from Small World Mall. 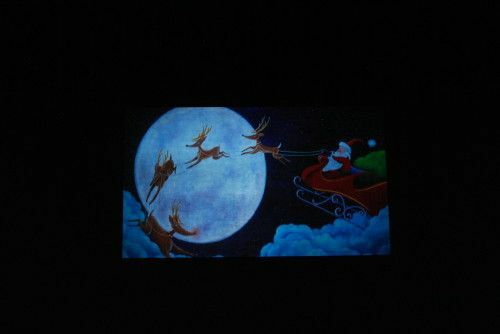 It was a really cute show. 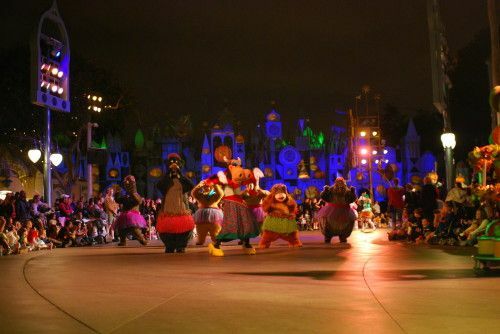 It has lots of dancers and familiar characters. 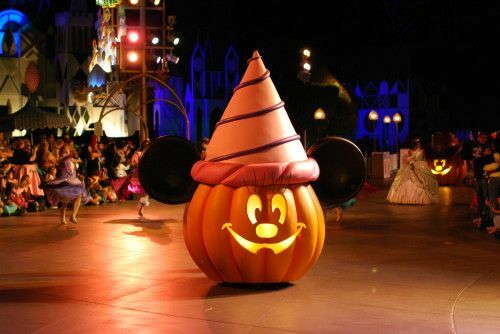 I really liked the little Mickey pumpkin heads! 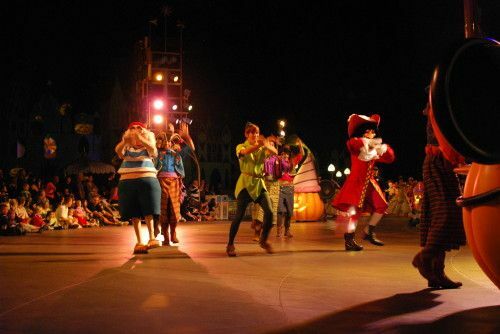 Between each of the heads were sets of dancers: Princesses (Snow White, Aurora, and Tiana), Western (Woody and Jessie), Monsters (Sully), Pirates (Hook, Peter Pan). 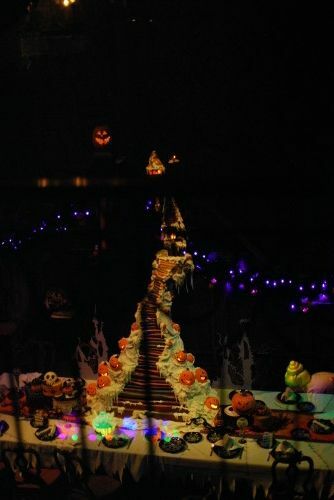 There was also Halloween Car when guests from the party. 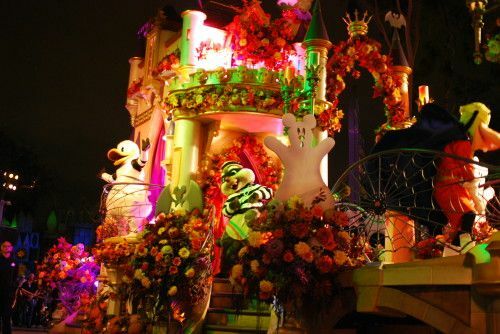 The final float had the main characters (Mickey, Minnie, Donald, Daisy, Chip & Dale, Stitch). 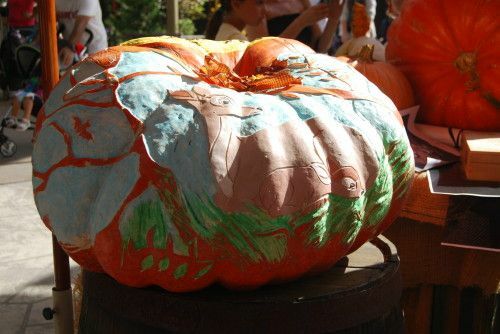 And on the back fo the float was Miss Piggy (I wonder where Kermit was?). 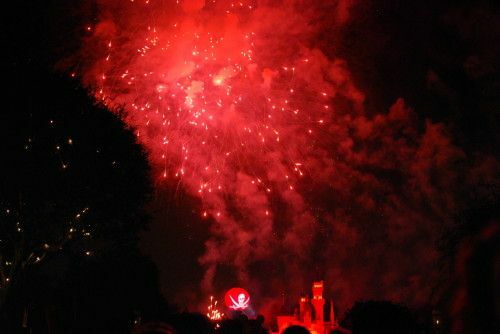 After the Cavalcade was the fireworks! My favorite part was when Zero flew. 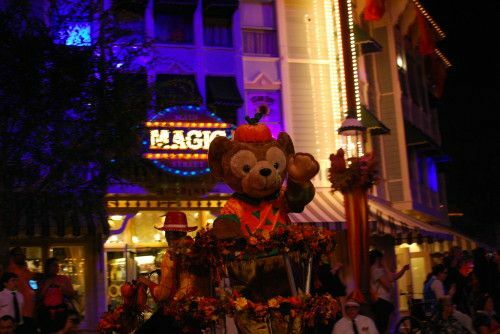 We were wandering around the park and it was getting close to 9:10 pm or so and we decided we'd better get to Main Street to find a good viewing locations. 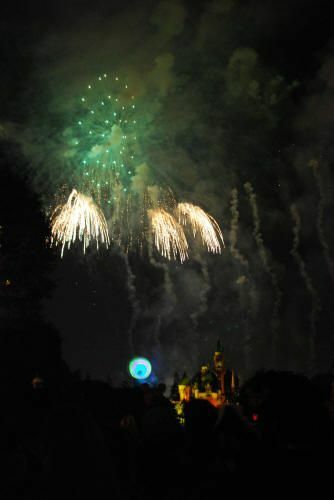 We usually like to watch the fireworks from Main Street, between Refreshment Corner and Carnations. 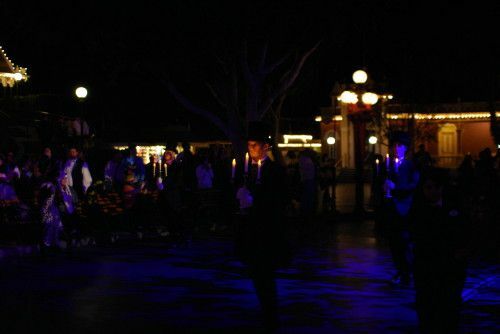 Usually the area is pretty crowded within the last 30 minutes, but when we got there there were only a handful of folks waiting! 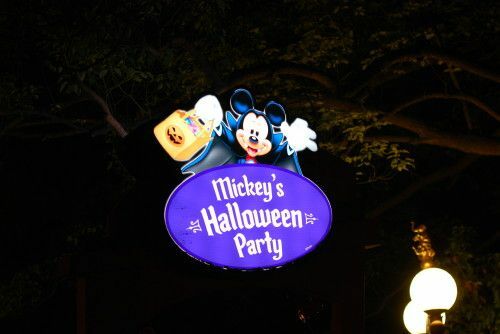 We were so surprised because we had heard this was a "sold out" party. 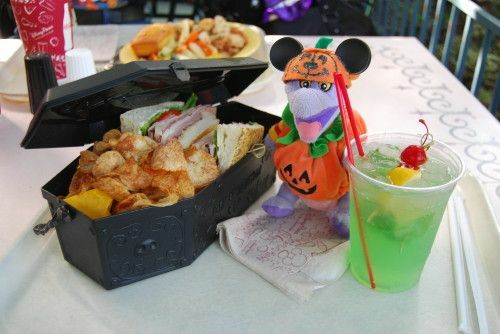 Anyway, we grabbed a table at Refreshment Corner and waited until 9:25 or so to head out to Main Street. 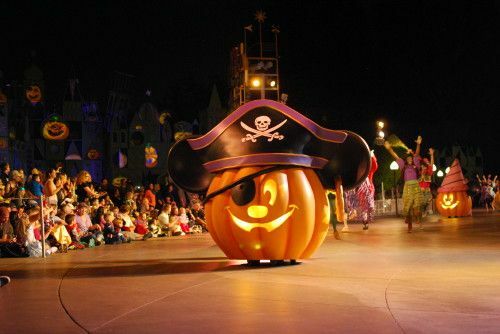 After the Cavalcade and fireworks we began Trick-or-Treating. 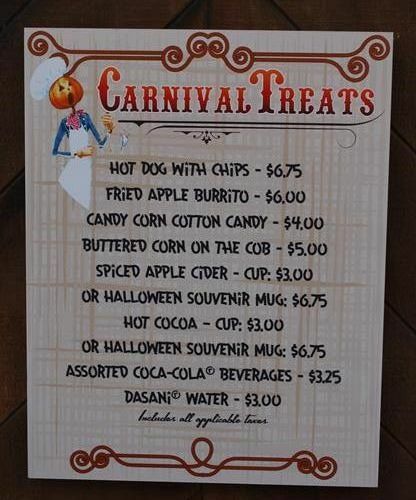 I've gone to several MNSSHP at WDW and most places have a single treat station at each location. 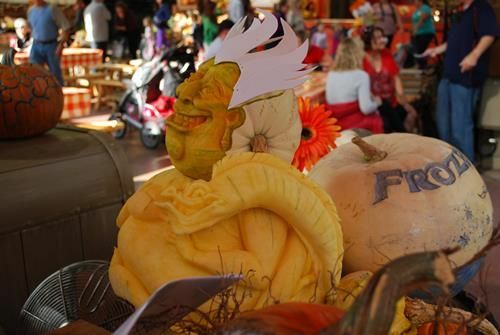 Almost all of the locations at DLR had several stations (essentially, every one was a treat trail!). 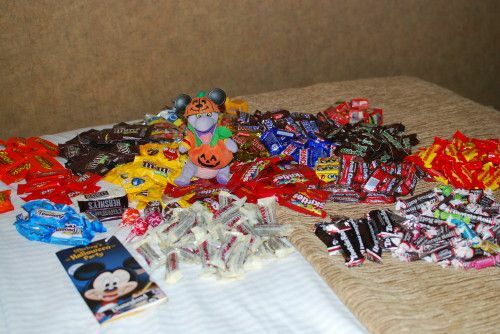 We ended up collecting a lot of candy (lots of yummy chocolate). 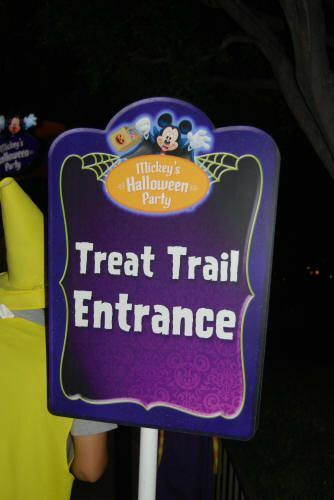 This is one of the treat station signs. 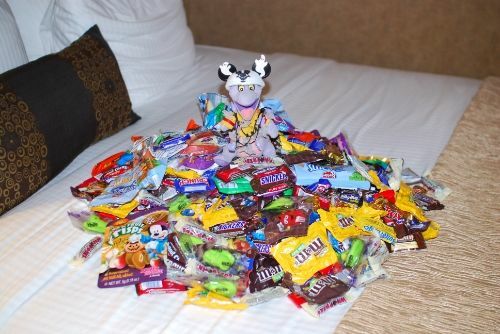 Trick-or-treat candy collected - about 12 pounds! 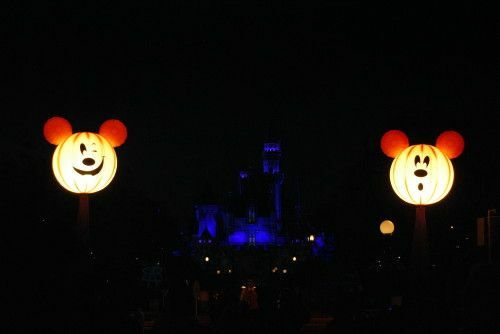 Overall, we really liked Mickey's Halloween Party. 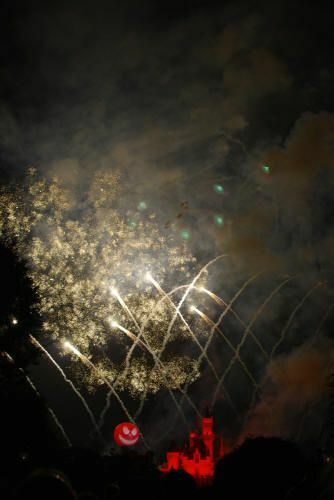 The Cavalcade was cute and the fireworks were really good. 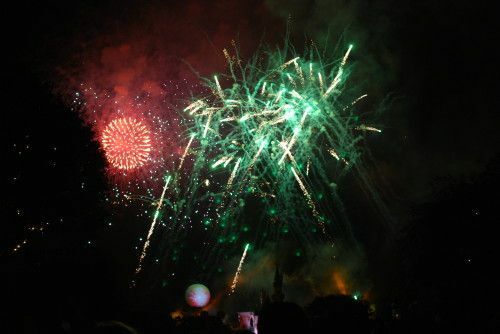 I'd happily go back next year! 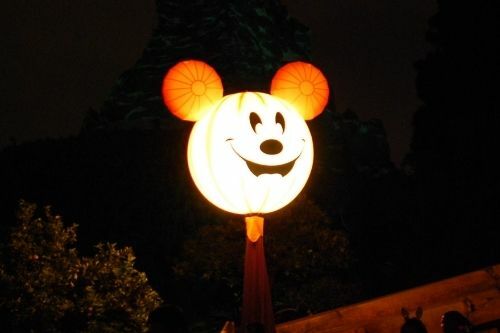 The final installment of my Halloween photo report. 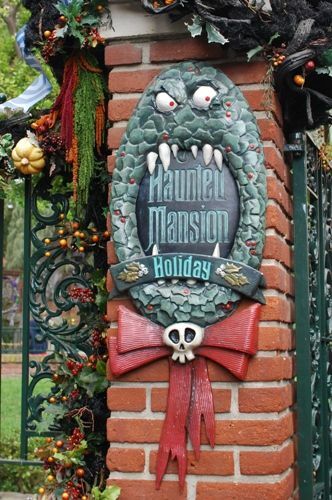 No trip to DLR during Halloween would be complete without seeing Haunted Mansion Holiday. 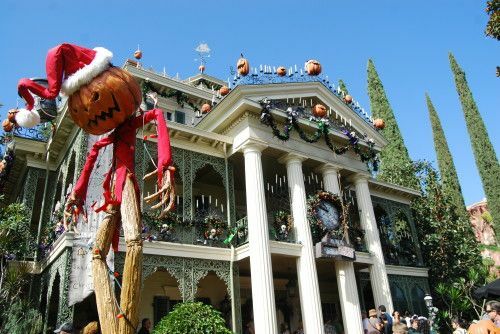 Overall, it's grown on me over the years; I still like the regular Haunted Mansion better, but the holiday one is still fun to see. 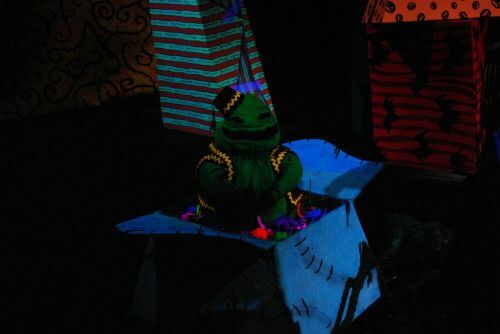 It had a pretty steady crowd throughout the trip (with stand by wait times ranging from 15 to 60 minutes). 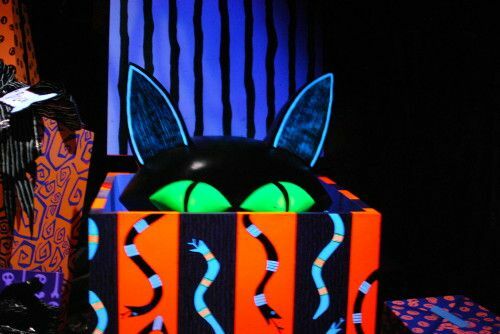 We ended up using Fast Pass pretty often. 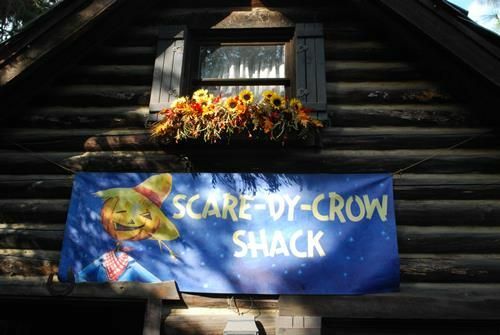 Entrance to the Fast Pass distribution location. 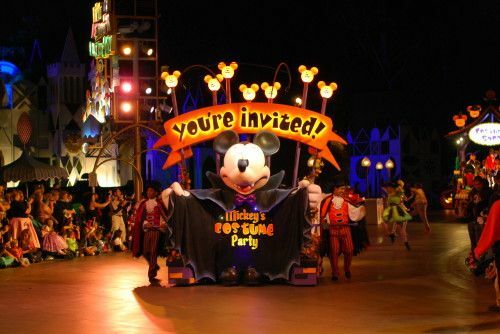 One of the few times, I've ever seen the FP area open. 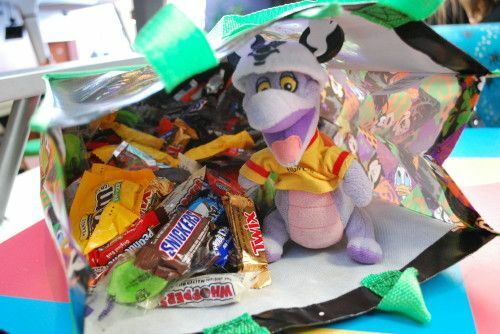 Figment just got back from a trip to Disneyland for Halloween! 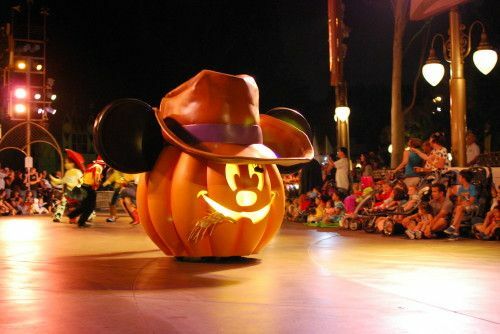 He "dressed up" as Lightning McQueen and a pumpkin (depending on the day). 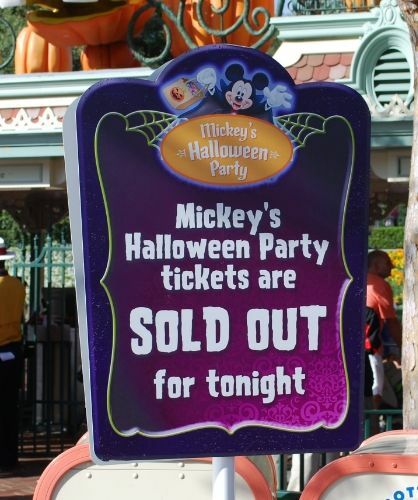 When we got to the park late-morning, there were signs at the entrance saying that the tickets for tonight's party were sold out. 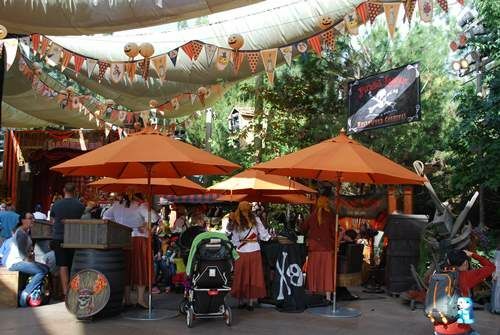 At 4 pm, when party ticket holders were allowed in, there were special turnstiles set aside for us. Only folks with ticket were allowed to use these because they funneled directly into CM with wristbands. 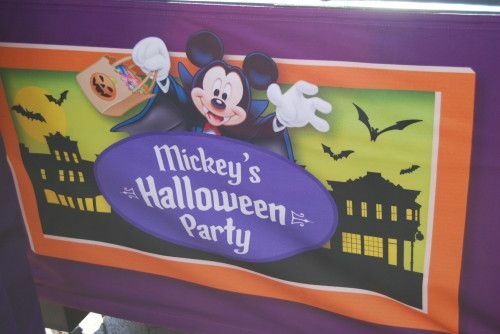 The trick-or-treat bags were stashed in rolling bins with the party logo on the side (very cute). As others have mentioned, the wrist bands were shiny yellow with a giant "#1" on the them. 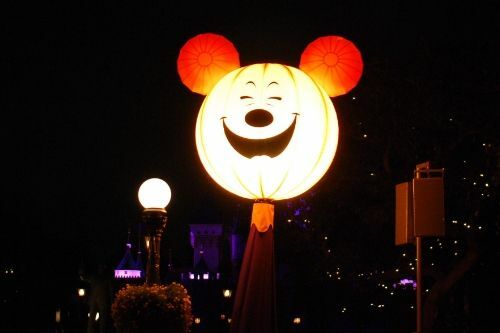 At the end of Main Street, around the hub, were the Mickey pumpkin head balloons. They're really cute. 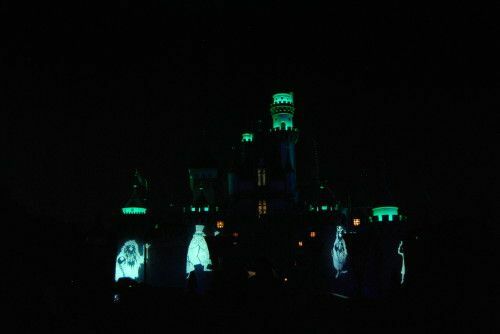 The projections on the castle changed depending on the music. 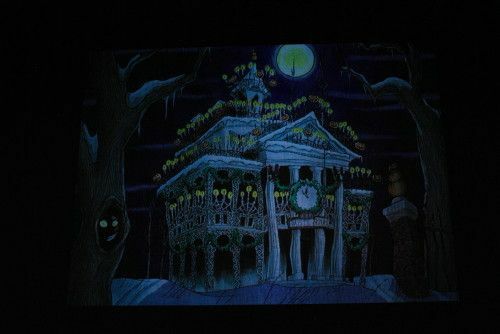 My favorite were the projections of the three hitchhiking ghosts. 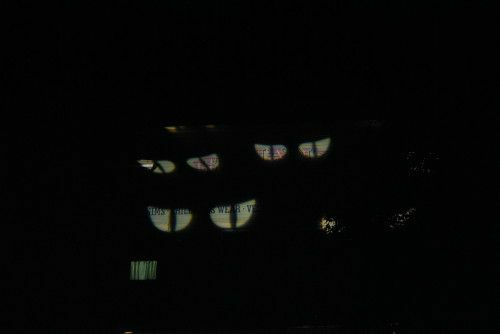 By the Halloween Tree, they were projecting cat eyes onto the building wall. 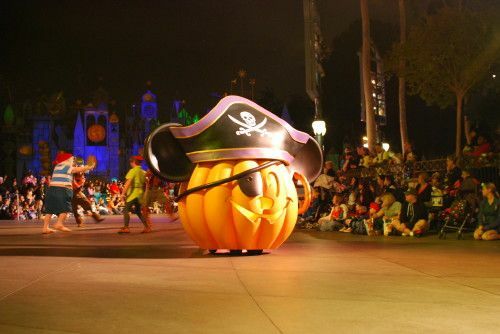 The Piratepalooza dance party was already in full swing. 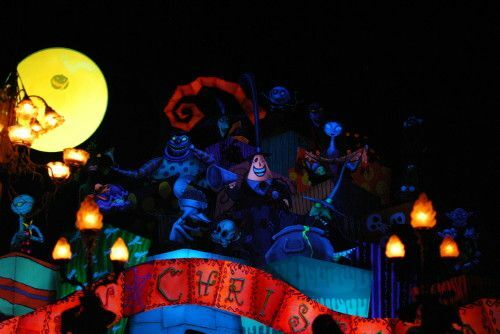 Saw lots of characters there. 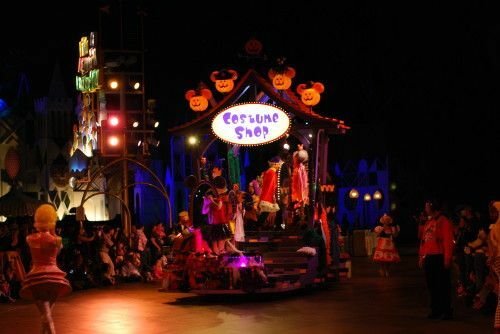 It was pretty cute...lots of children dancing in the middle with the characters and the parents standing around the perimeter watching (and taking photos). 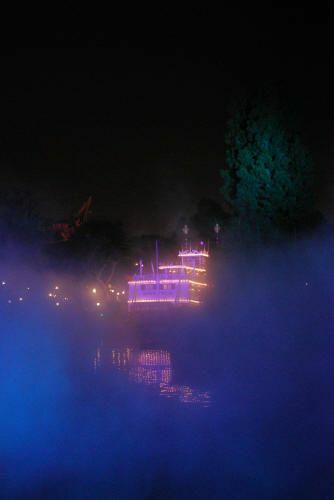 One of my favorite effects at MHP is the dry ice fog on the Rivers of America. 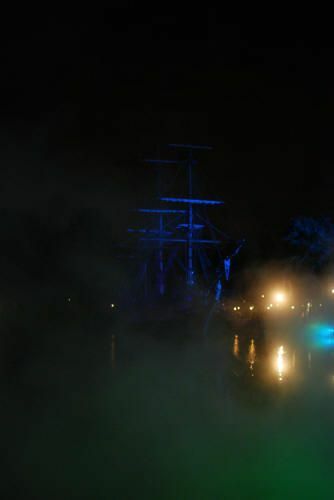 It makes the Columbia look very eerie. 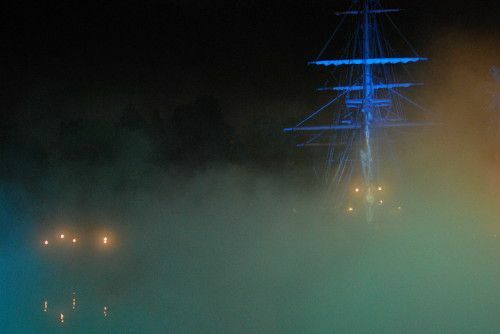 When the fog just finishes, it almost obscures the Columbia. 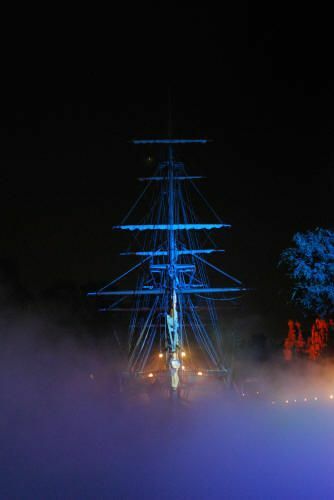 It wasn't very cold on Friday, so the fog disputed pretty quickly, but the jets kept adding more throughout the night. 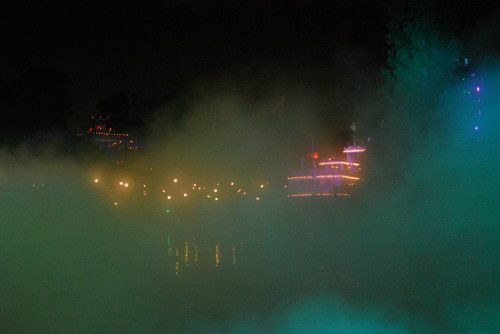 Looking the other way, the Mark Twain also looked pretty eerie through the dry ice fog. 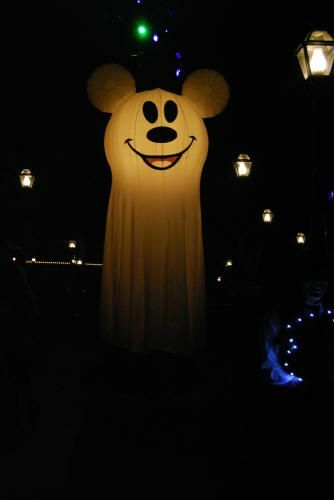 A lot of the trick-or-treat trails/spots were marked by a giant Mickey ghost balloon. There were also signs to let you know where the trail started. Some trails had multiple stops, while others only had one. 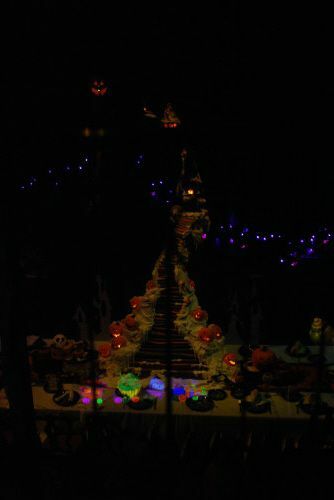 One of the treat trails as inside the Diamond Horseshoe building. 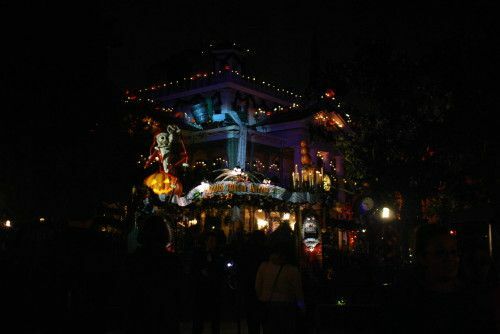 They had the inside decorated. 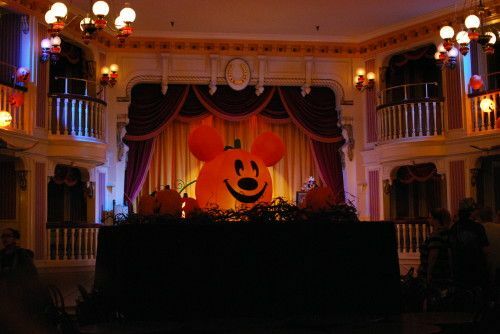 There was a Mickey pumpkin balloon in the middle (the treat trail went around the perimeter of the room). 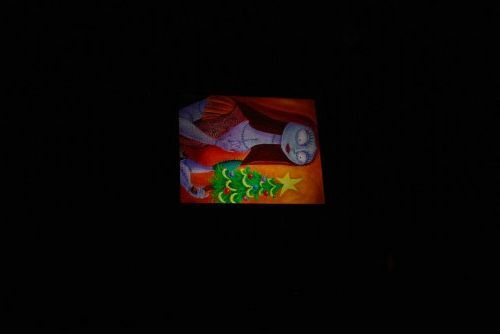 On the stage they had some changing portraits (kind of like the ones normally in the HM) and some ghost cut-outs on the balcony. 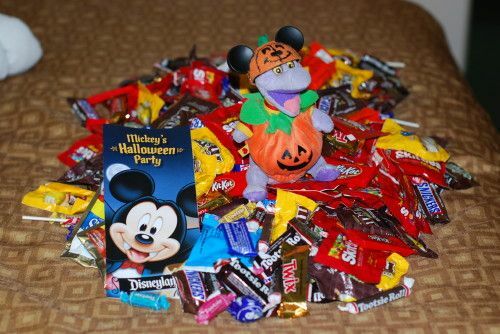 This year's candy had a pretty good assortment. We got Snickers, Milky Ways, Reese's Peanut Butter Cups, Kit Kats, Almond Joys, Starbursts, Tootsie Rolls (lots of those), and other things. 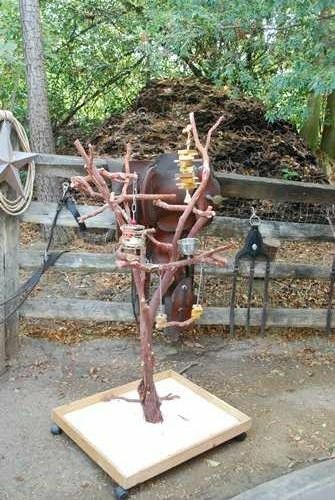 They had Craisins, apple slices, and raisins as well. 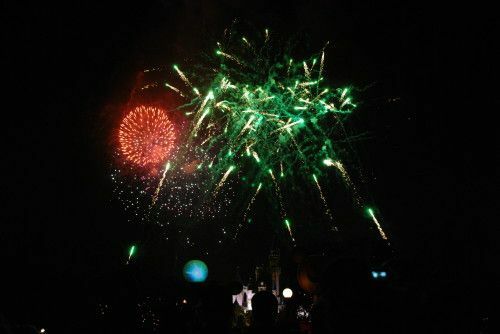 Okay, now some photos from the 9/28/12 fireworks show! My favorite part is that Zero flies! 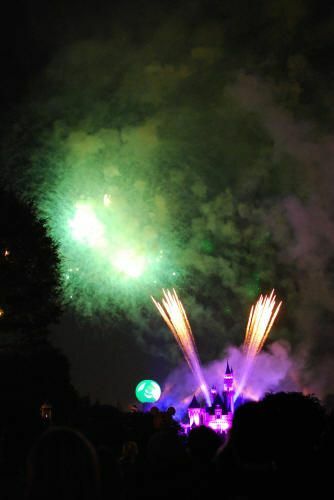 The rest of the fireworks show is really good. 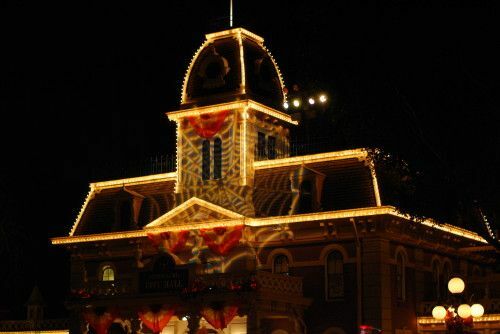 I really liked how they used the globe with the projections. 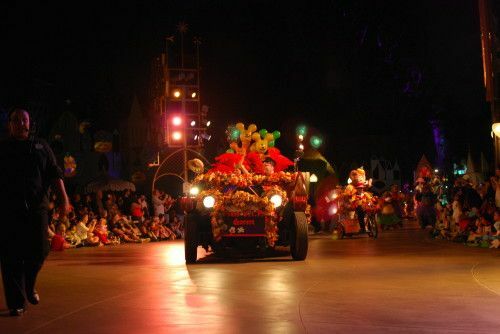 The Cavalcade is a cute "mini-Parade". 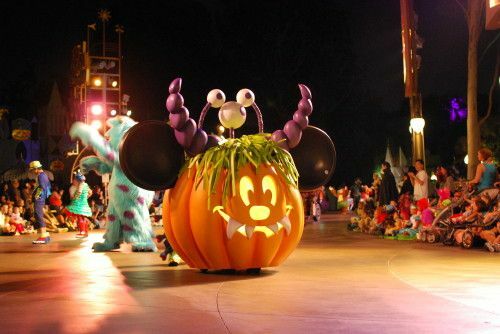 I really like the push cart pumpkin Mickey's and the characters in costume. 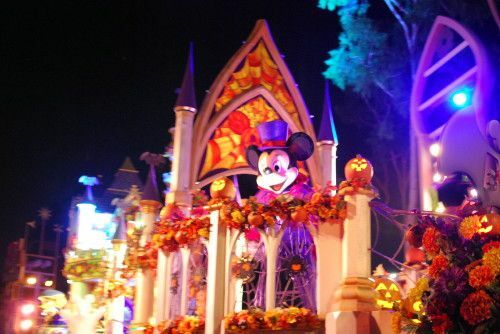 The Cavalcade opens with Vampire Mickey. 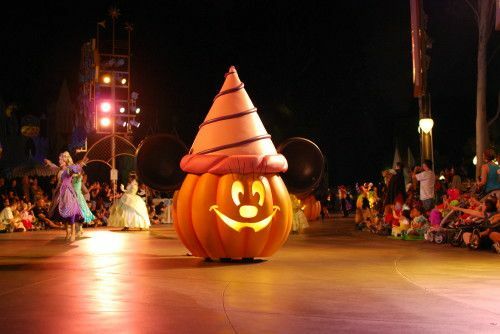 Each of the Mickey pumpkins are followed by characters in a similiar theme. 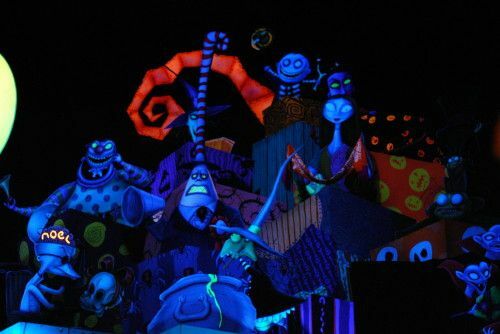 For example, the monster Mickey is followed by Sully and other monsters. 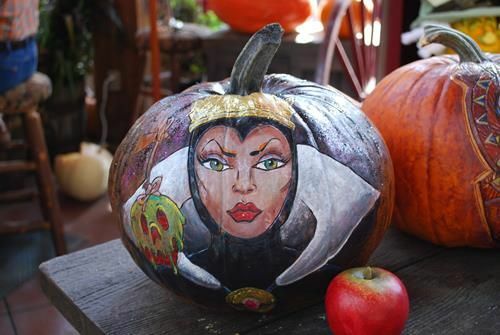 The princess pumpkin is followed by Snow White, Belle, and Tiana. 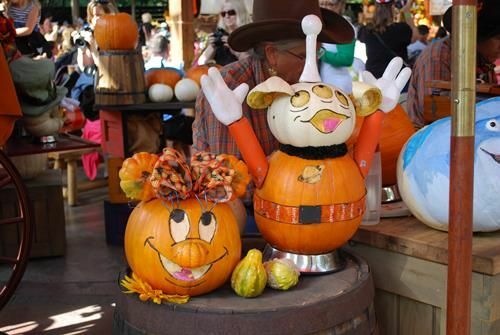 And lots of pumpkins from Big Thunder Ranch. 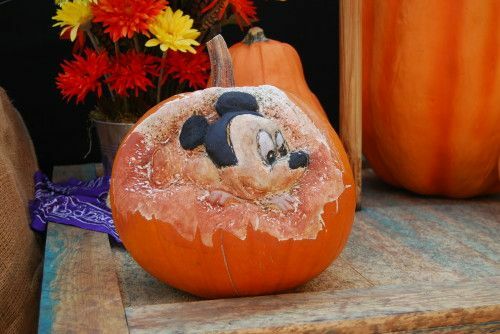 I don't know if it was because the weather was so hot last week, but more of the pumpkins this year were "etched" or painted opposed to carved. 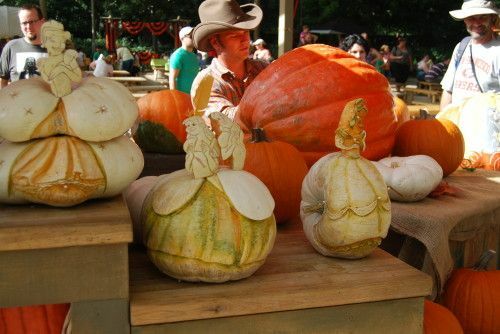 I really like the "etching" and have a feeling they last longer in the heat. 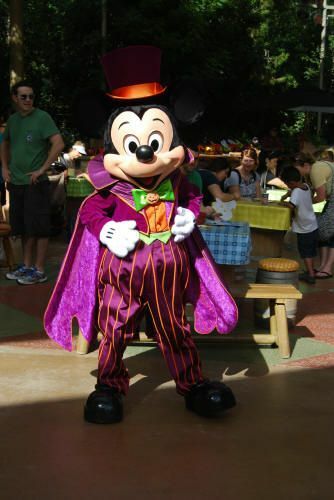 Finally, as I was walking around Big Thunder Ranch, Mickey came out and was stopping for photos with folks. He even posed for me! 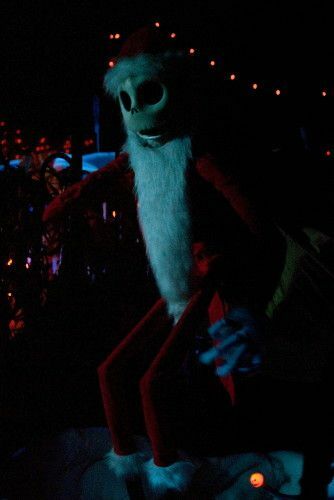 We rode Haunted Mansion Holiday several times and here are some photos from the ride. 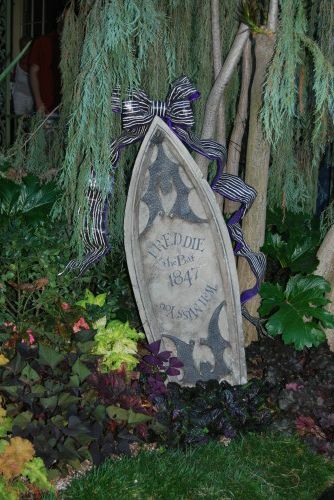 It'll take two posts because there are so many photos! 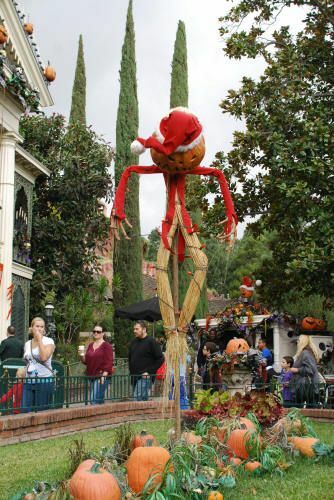 The scarecrow. 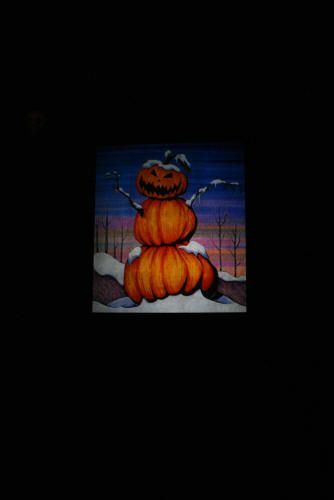 He's also on the pin for this year's HMH pin. 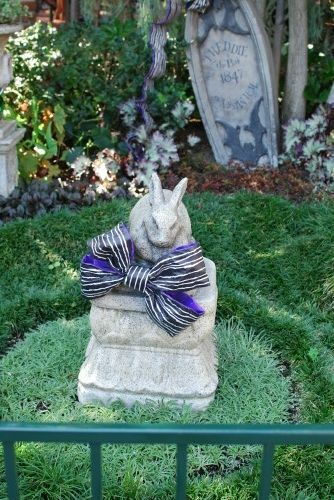 The pets in the cemetery. 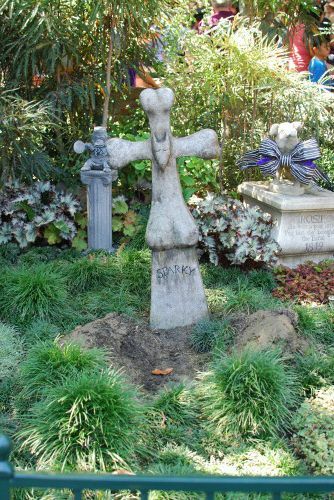 I never noticed the area in front of Sparky's grave being dug up before! 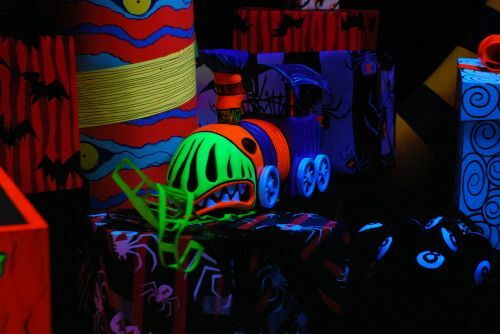 Now inside the ride...most of it seemed to be very similiar to last year, with the exception of the gingerbread house. 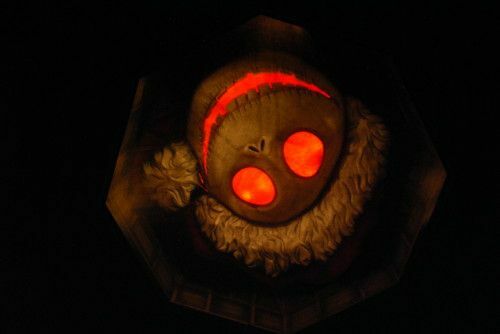 The giant Jack head in the elevator! 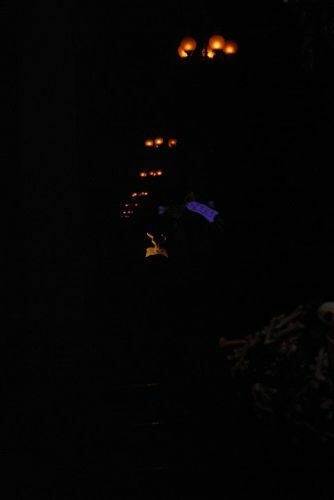 Then onto the endless hallway with little zero floating behind a large pile of bones...this was one of the hardest pictures to get because it's so dark and Zero is so small! 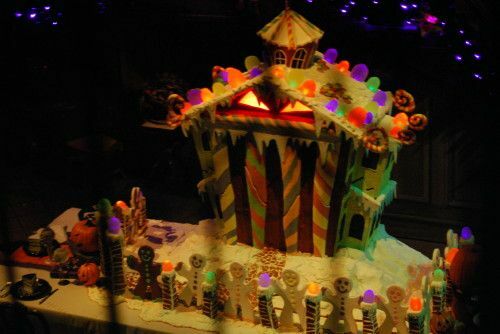 Then onto the ballroom with the Gingerbread House...this years was very tall, but the house itself was very small. 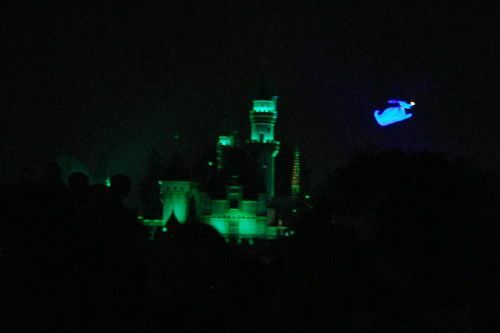 Zero flew around the top and a ghostly train circled the bottom. 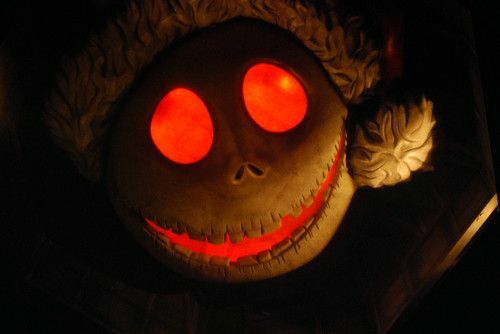 Then it was onto the attic, which was filled with toys that "were strange and bizarre and on the attack!" 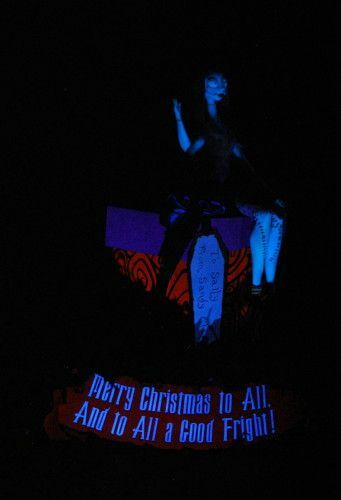 And as you exit the ride, Sally waving good-bye. 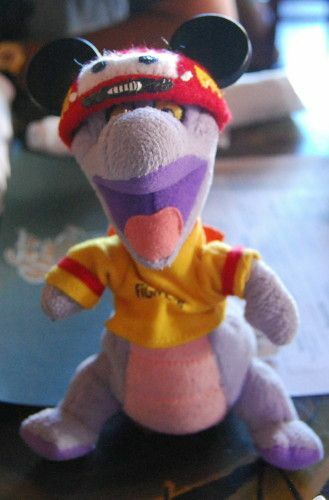 Figment and I (plus my family) just got back from one of our longest trips to Disneyland! 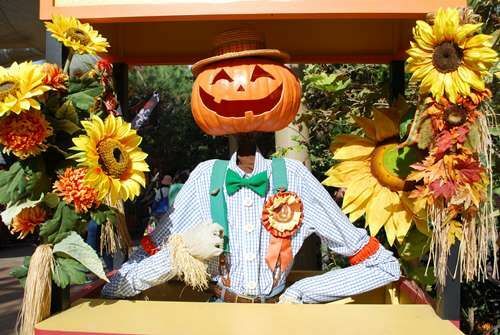 We arrived in time for the Tuesday (10/8) MHP and stayed through Sunday (10/13). Overall the trip was really good and we had a great time. Crowds were high, but we expected that, so we were prepared. Weather was pretty good (except Wednesday when it rained!). 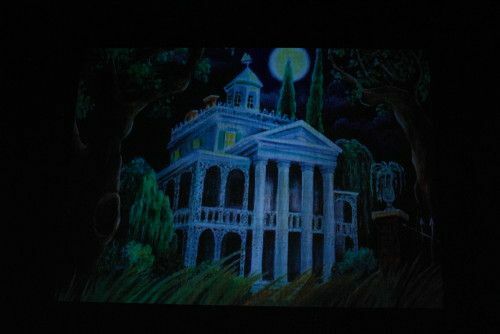 I have lots of pictures to post, but I'll start with MHP because that was the big event for the trip! 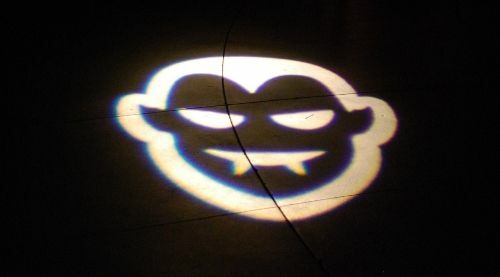 I went to both the Tuesday (10/8) and Friday (10/11) party, so the reviews will be inter-mixed. 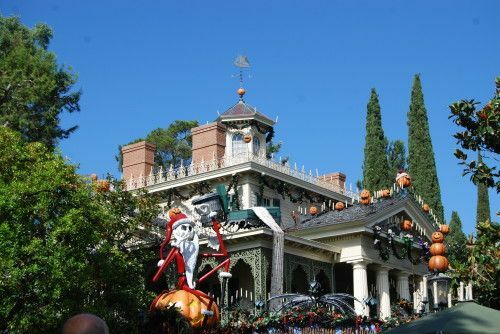 We arrived at Disneyland mid-morning on Tuesday and headed to the park. 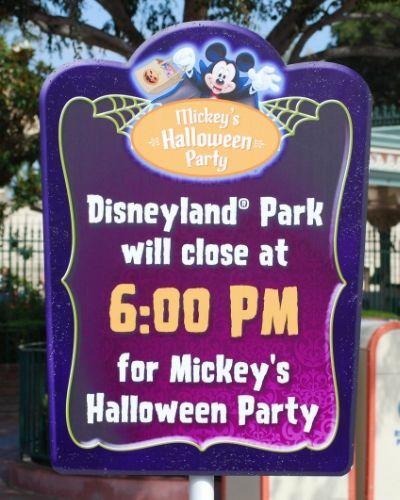 There were signs out announcing the party and that Disneyland would be closing at 6:00 pm, but no signs indicating the party was sold out. 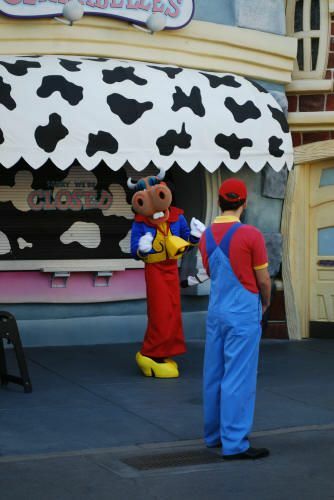 Once inside the gates, there was a sign announcing Toontown would be closing early. 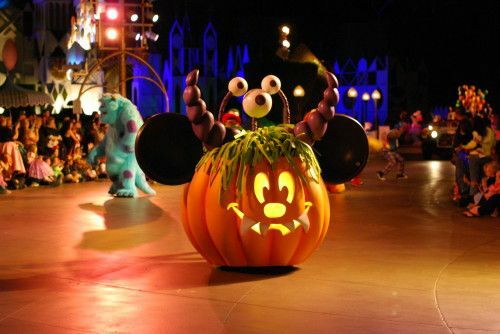 It closes two hours before the end of the "normal operating" day for Disneyland. 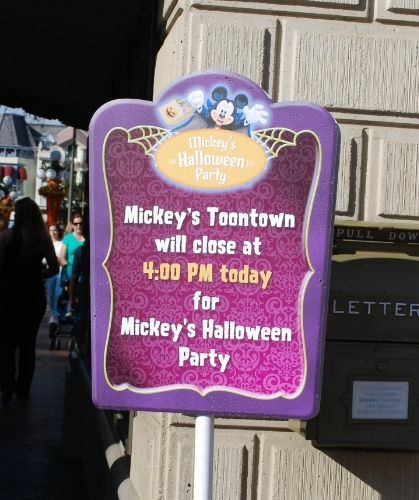 So in the case of a 6:00 pm party, it closes at 4:00 pm. We spent the rest of the morning and early afternoon having lunch and enjoying ourselves. 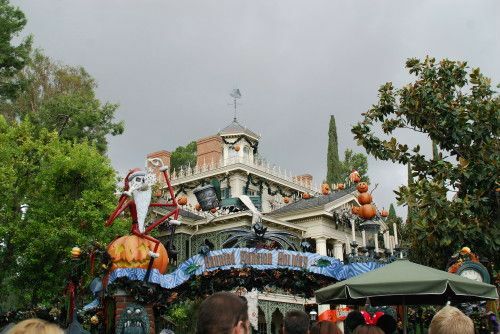 I was pretty surprised at how crowded the park already was. 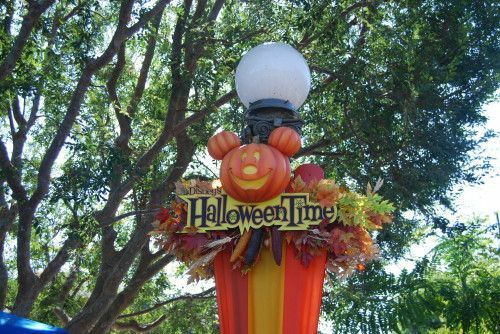 We had to head back to the hotel to finish checking in and by the time we got back to the park, it was a little past 3:30 pm. 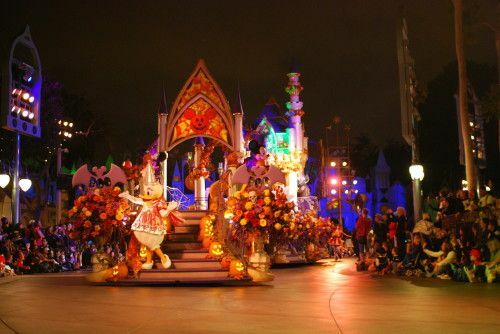 Roughly half of the gates were for special event guests (Harbor Blvd side) and the other half were for normal tickets (DTD side). The MHP gates stretched nearly 3/4ths of the way across the Esplande! 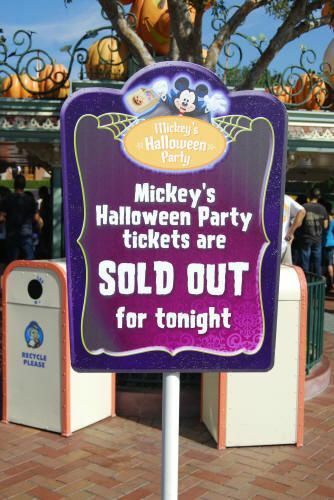 There were now signs out saying the party was sold out! 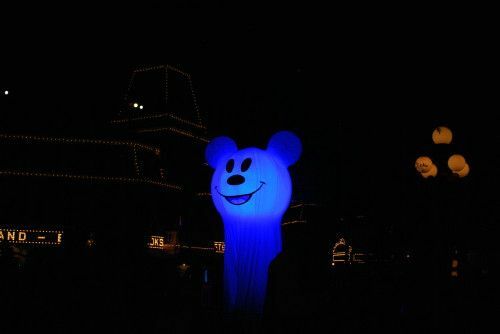 Rather than wait in the long lines at the gate, we headed back into Disneyland and decided to get out wristbands and treat bag inside the park. 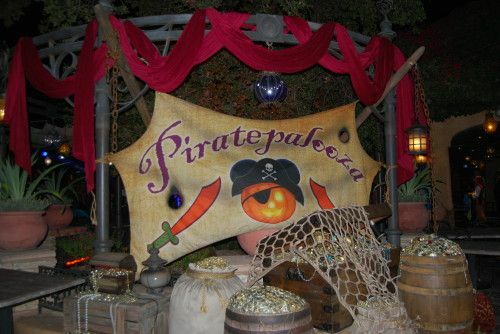 There was an internal locations set up inside Frontierland (near the pin store, same place as last year). 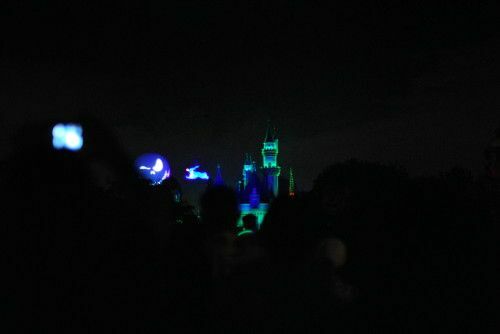 The line stretched across the bridge and then wrapped around the hub towards the Castle. While the line was long, it still moved pretty quickly. 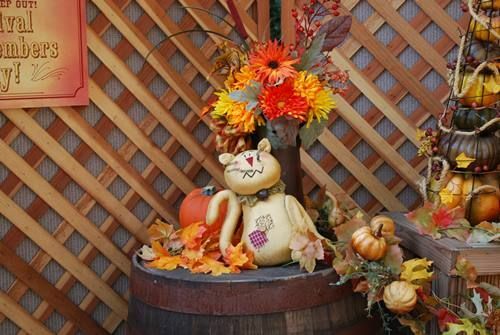 They had already begun to set-up the party decorations. 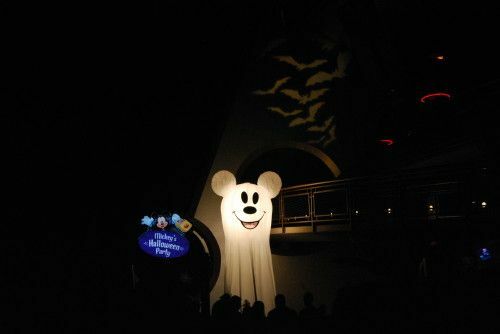 It was kind of funny to see the Mickey Ghosts set-up, but not yet inflated. 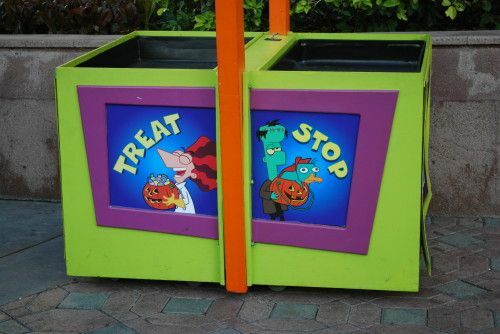 The treat trail stations were already in place as well, but not yet stocked and open. 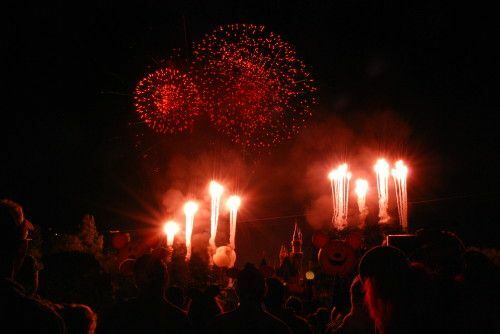 We still had a lot of time before the party started, so we wandered around the park for a bit before heading to the pre-party event at Toontown. There was a sign out telling folks about the event. 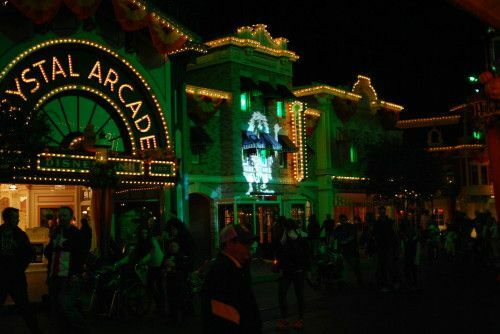 On Tuesday, we arrived at Toontown a little before 5:00 pm (when it opened). 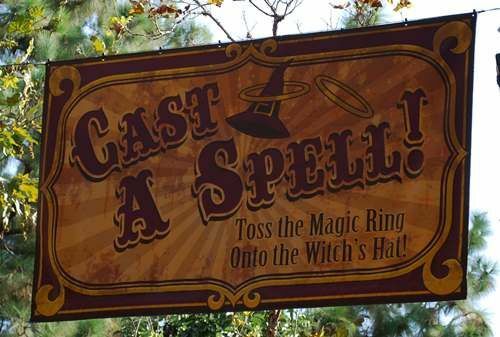 They were allowing guests to get into the queue (you have to show your wristband). The queue is basic three long lines that stretch from the entrance of Toontown, under the train tracks, and out by Small World. 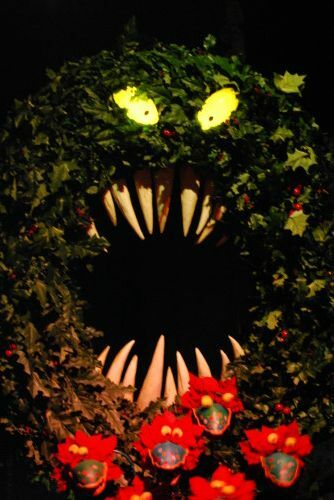 When Toowntown opens for MHP, the first line enters, then the second, and then the third. 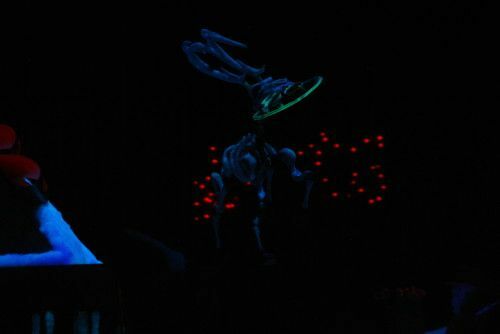 For folks who've been to Lights, Motor, Action Extreme Stunt show at DHS, it's the same set-up. 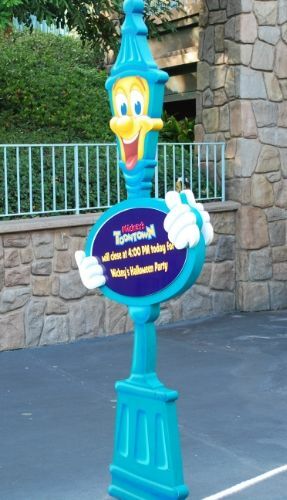 Toontown's pre-party event has four treat trails and several character meet and greets. 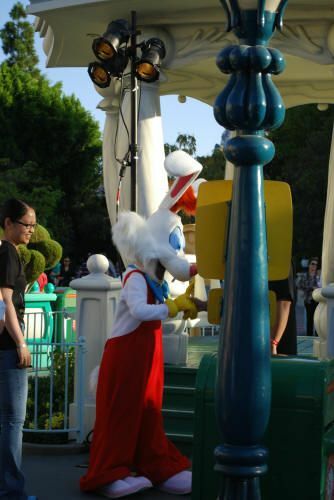 Both Roger Rabbit's Car-toon Spin and Gadget's Go Coaster were running when I was there. 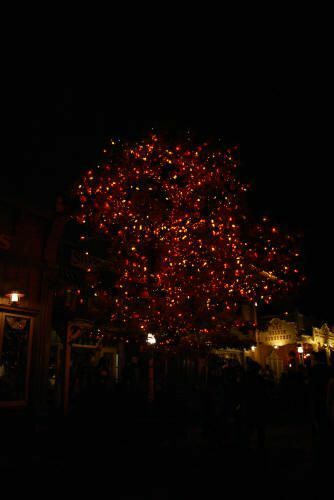 The lines for the treat trails just inside Toontown were already pretty long, so we headed towards the ones at Mickey's and that line wasn't too bad. 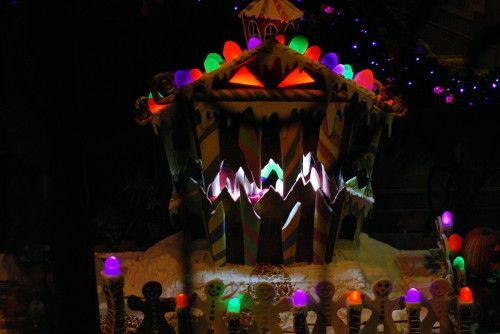 There were nine treat stations in the Minnie and Mickey house trail, four at Donald's Boat, and three stations at the other two trails. 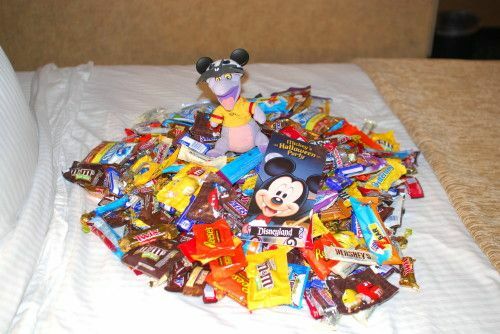 We got a lot of candy by going to Mickey and Minnie's trail. 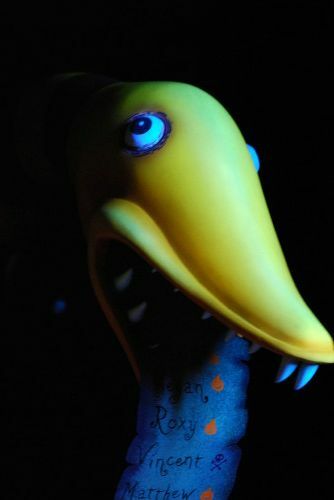 On Tuesday, the Toontown trails were the only place where we got Peeps, but on Friday, they didn't have them! 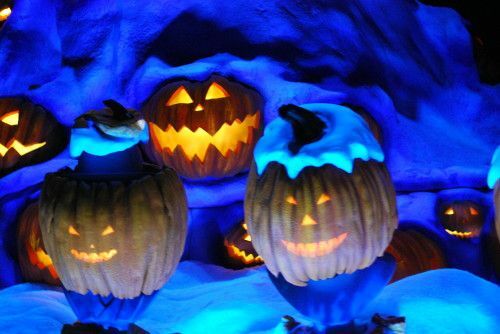 We arrived later (about a half hour after it opened) on Friday, so all of the treat trail lines were longer, but we still managed to visit all four in about 45 minutes. 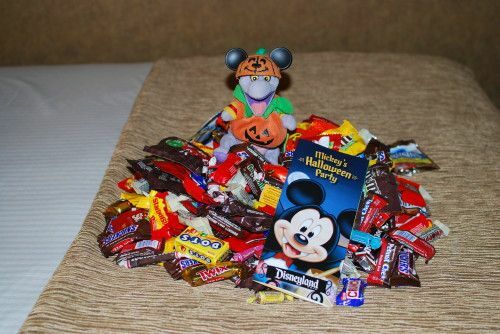 On Tuesday, we did only the Mickey and Minnie houses and Donald trail and three people got enough candy to fill one of those Halloween 2013 reusable bags about half way! 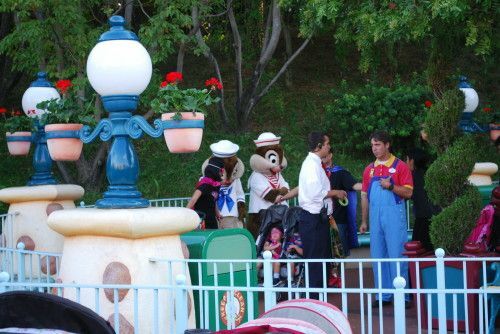 I didn't meet the characters, but I did see Clarabelle and Roger Rabbit on both days, Chip & Dale on Tuesday, and Goofy on Friday. 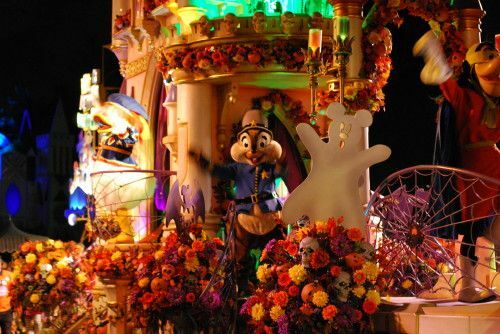 Most of the characters were in the center of town, but Chip & Dale were over in the kid's play area. 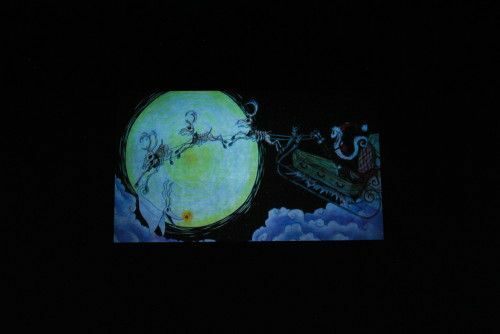 The schedule of events were the same at both parties (despite the different start times). 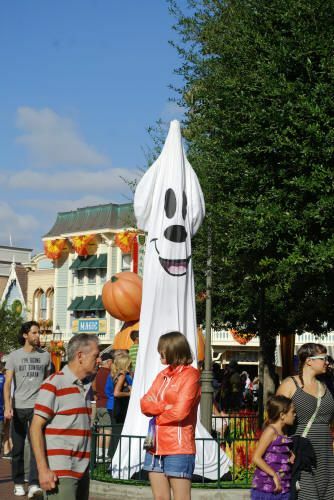 Right when the party starts, the CMs start forming check points throughout the park. 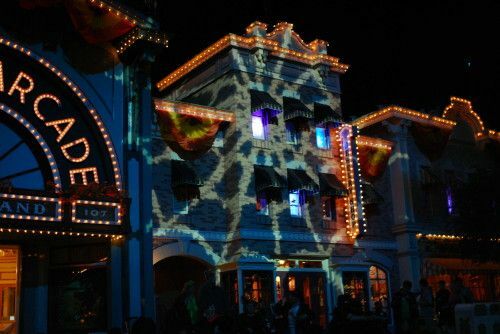 If you don't have a wristband, you can't go into stores, restaurants or get into ride line. 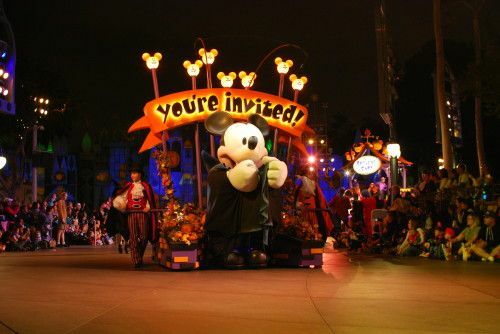 Main Street did remain open, so you can go there, but other than that, they pretty effectively funnel non-party guests out of the park. 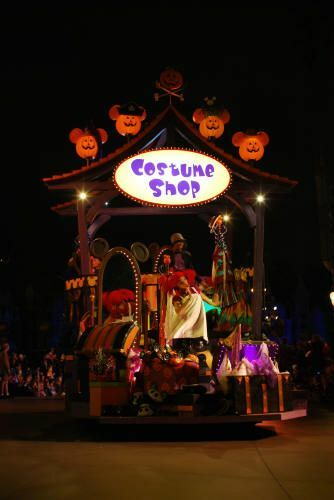 We didn't do any rides the party, albeit we thought about going on HM to see if the CM were "in character". 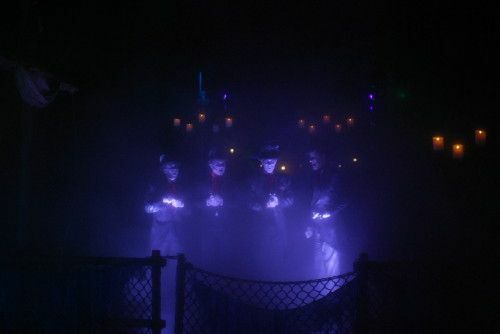 They were wearing the dead-white face make-up, so we were curious to see if they acted spooky (like they do at MNSSHP), but we didn't want to spend 30-45 minutes of party time in a line. 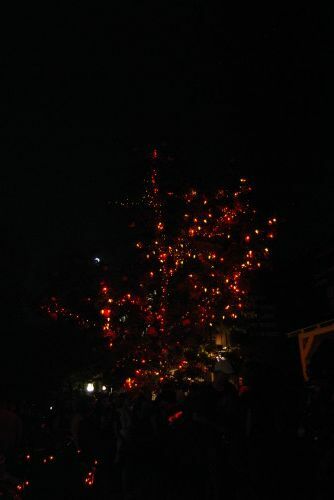 Instead we did treat-trails, wandered around the park, and soaked up the atmosphere! 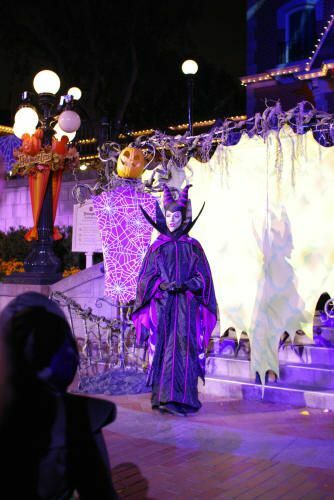 We made sure to go check out the Villains meet and greet at the end of Main Street. The line was pretty consistently long all evening (stretching to under the train track bridge). 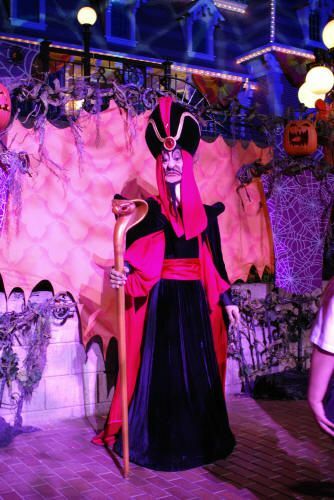 There were three villains at the meet and greet (one mask and two "face"). 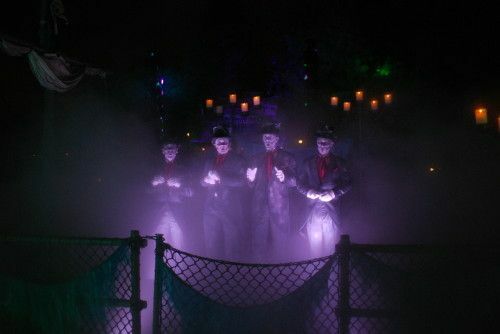 The one on the far left (when facing them) tended to be either Jafar or Hades. 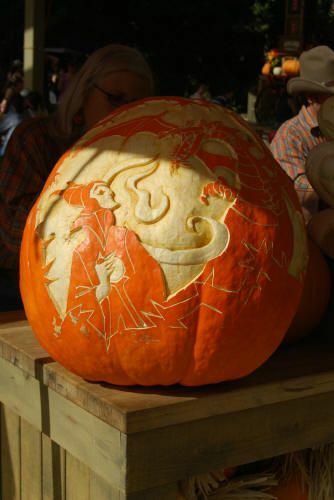 The other two were usually Maleficent and the Evil Queen or Dr. Facilier and Cruella. 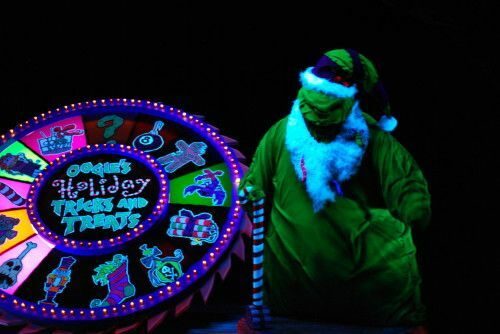 If you have a chance to check out the Villains entrance/exit, I would. It was pretty cool. 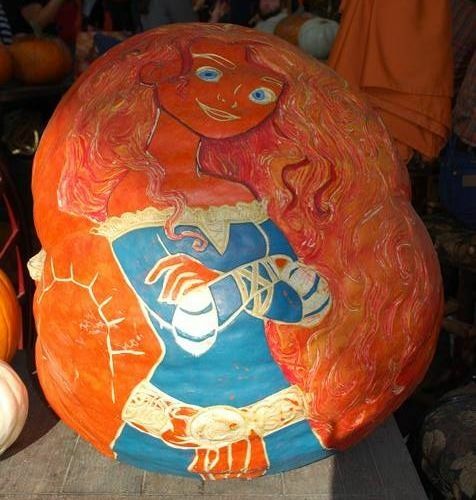 It happens every 45-minutes (when the "face" characters change). 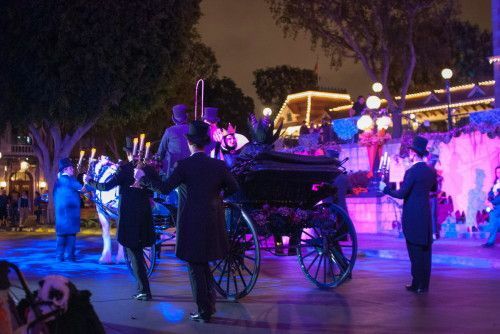 Candle carrying undertakers (that's what they looked like to me), come out and lead the way for a horse drawn carriage. 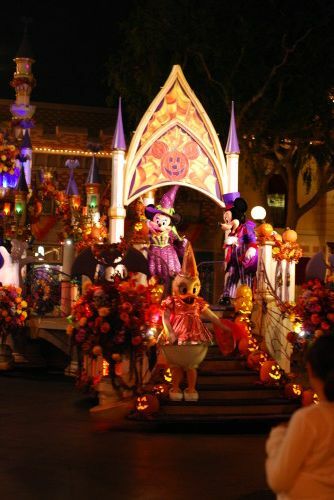 They come around Town Square and two villains exit the carriage and the other two get in. 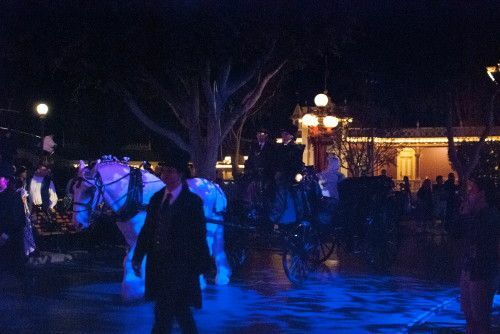 The carriage then departs. 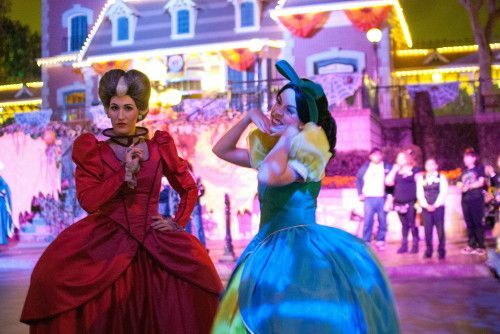 Usually Lady Tremaine and her two daughters are following the carriage and they interact with guests. 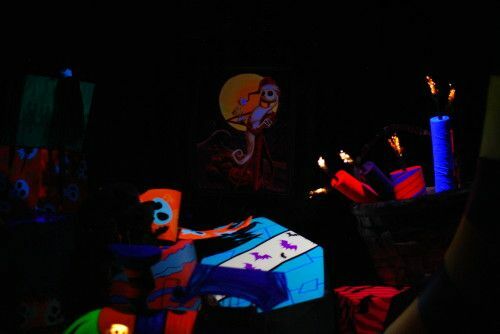 Lots of music and lighting effects as well! 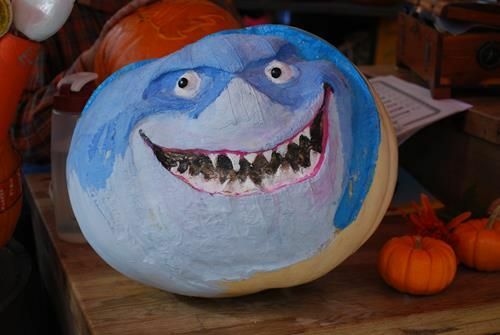 It runs at 8:30 pm and 10:30 pm. 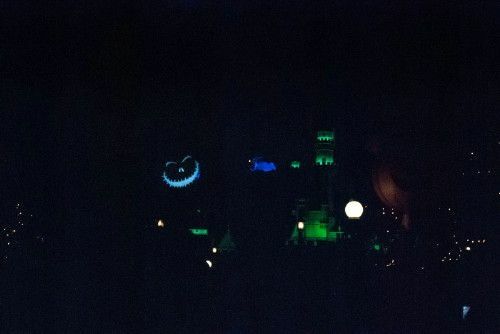 The 8:30 pm show starts at It's a Small World and progresses to Main Street. 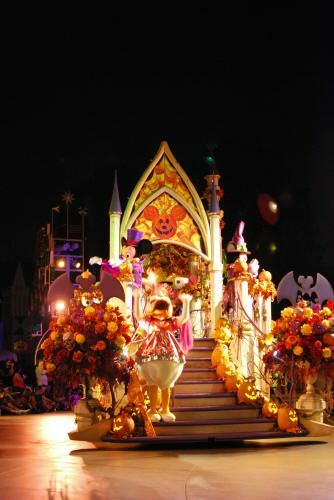 The 10:30 pm show starts at Main Street and heads back to It's a Small World. 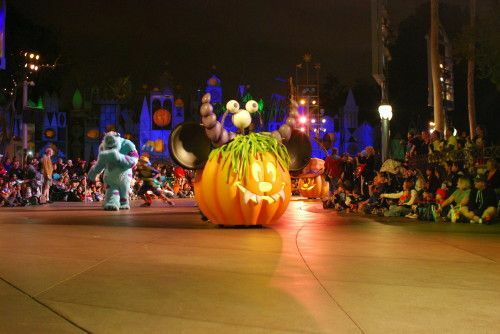 While not a full blown parade, it's still cute and fun to watch. In most cases (I think) you can get a pretty good view without waiting very long. 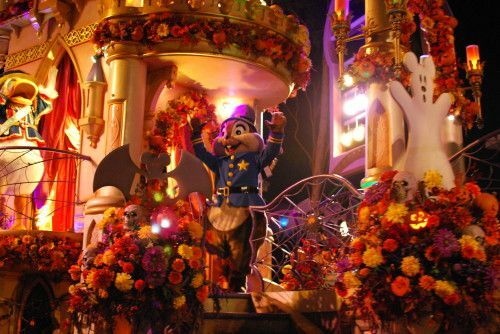 For the first parade (on Tue), I got a spot about 25 minutes before the Cavalcade (wanted front row, by IaSW), but for the others, I was on MS and waiting maybe 5-10 minutes. 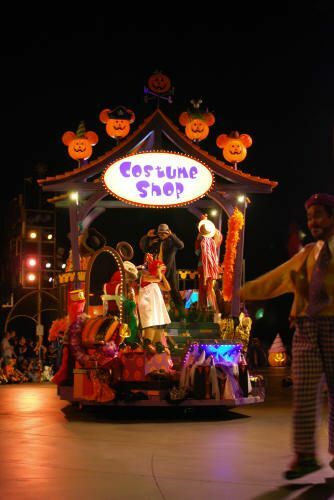 The second Cavalcade is less busy than the first on both nights! 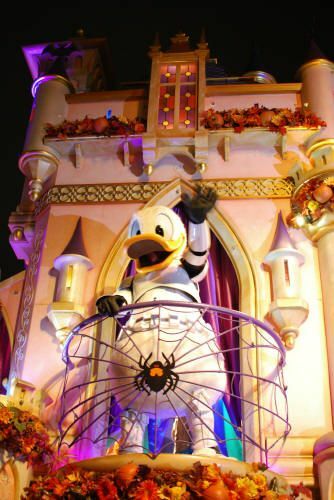 The Cavalacade starts with Vampire Mickey! 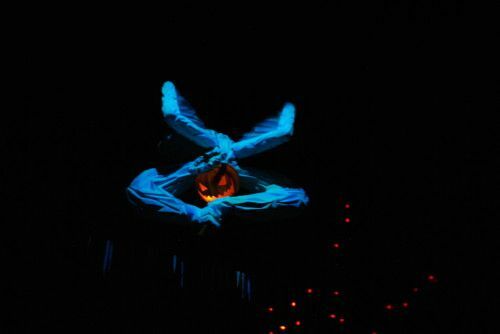 His arms open and close. He's pretty cute! 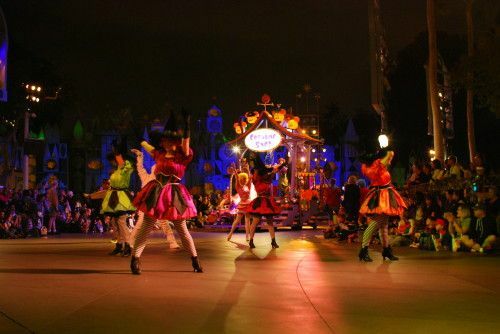 The next sequences of the parade consisted primarily of dancers and characters. 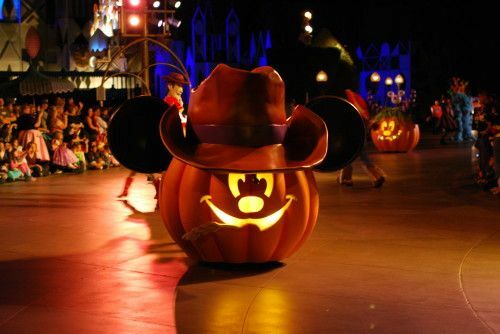 I love the Mickey pumpkins! 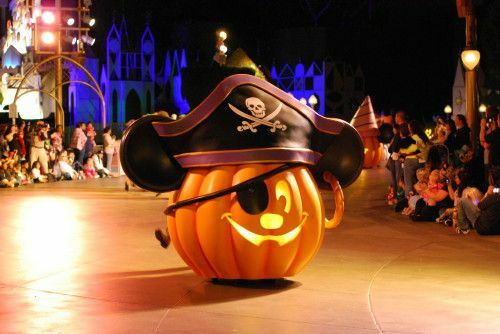 Pirate Mickey is followed by Peter Pan, Captain Hook, Wendy and friends. 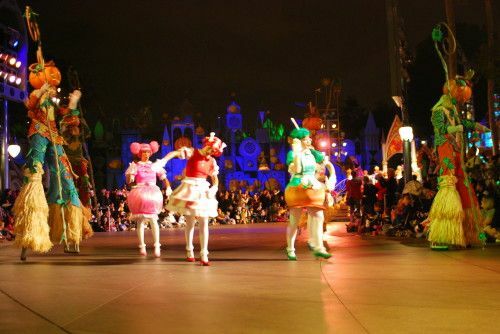 Princess Minnie is followed by Snow White, Tiana, and Aurora (I think), plus several dancers. 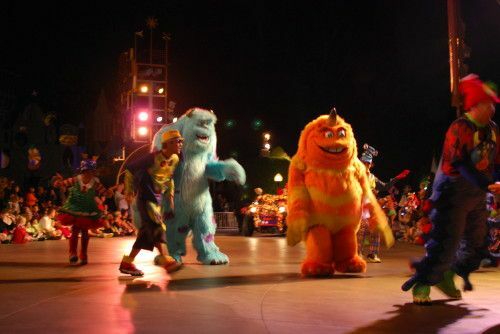 Monster Mickey is followed by Sully and several monsters (including an orange furry monster that tended to give high fives to the crowd). 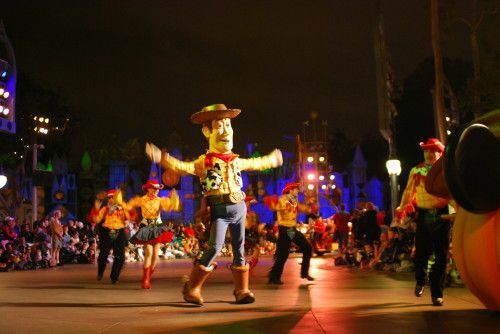 Finally, cowboy Mickey is followed by Woody and Jessie. 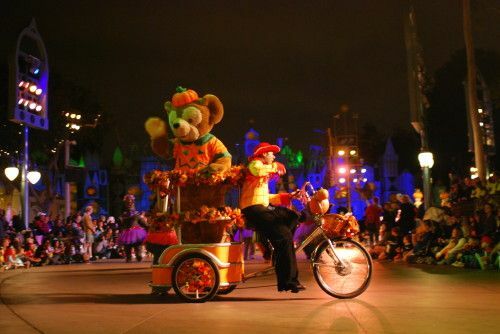 Next up was Duffy on a bicycle! 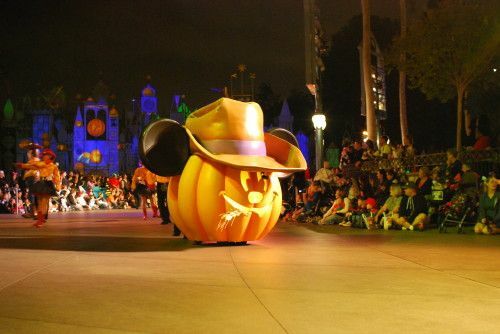 He's wearing his pumpkin costume. 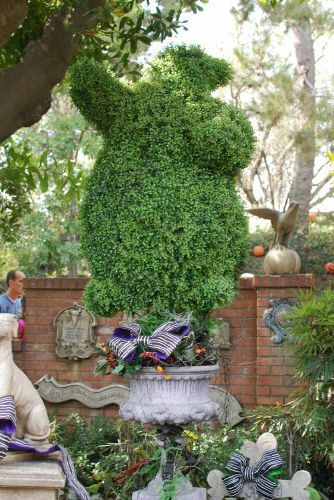 The next set of characters was kind of mish-mash, but mostly animals. 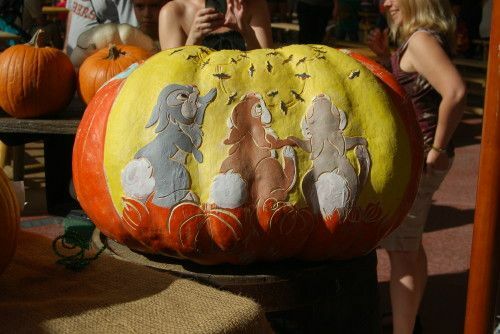 There was Clarabelle, Baloo, King Louie, and the bears from Country Bear. 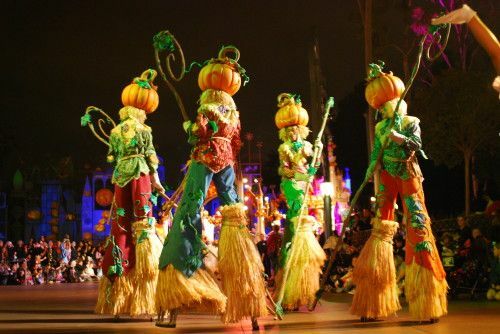 The next sequence had ragdoll dancers and stilt walkers. 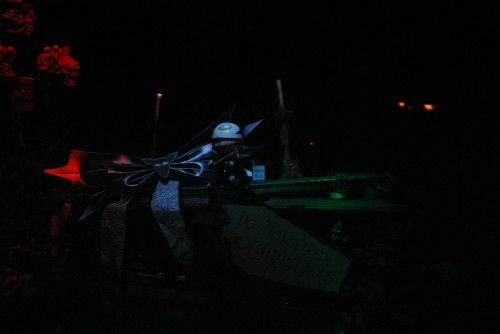 The silt walkers were pretty cool! 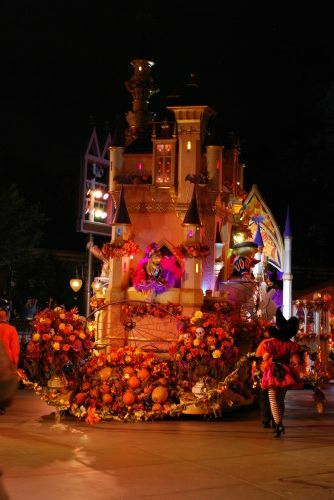 And then it was time for the final float of the Cavalcade. 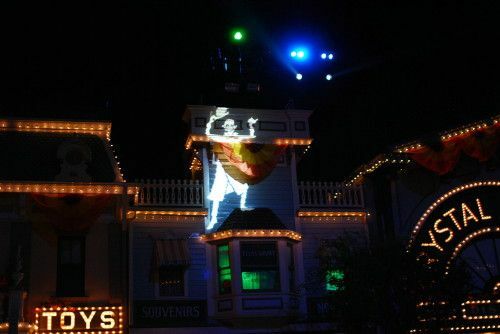 Daisy was on the front, Minnie and Mickey on the main platform. 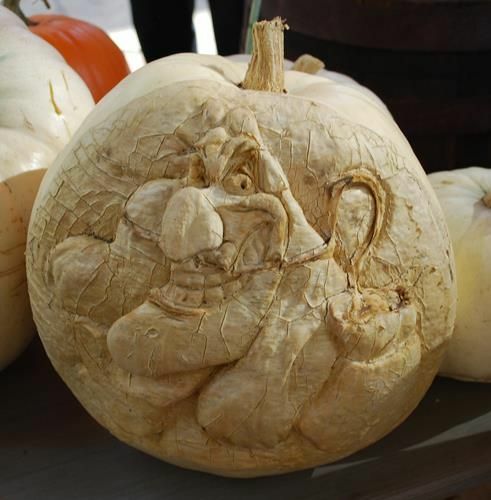 Goofy and Chip & Dale were in the middle. 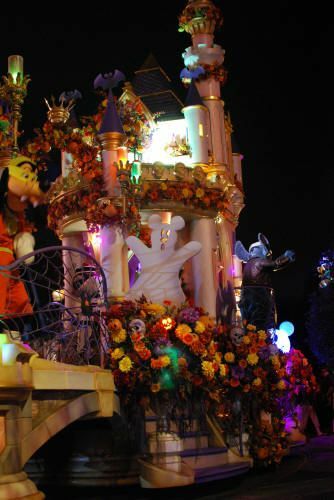 If you were on left side (when facing the float), you saw Stormtrooper Donald and if you were on the right, you saw Biker Stitch. 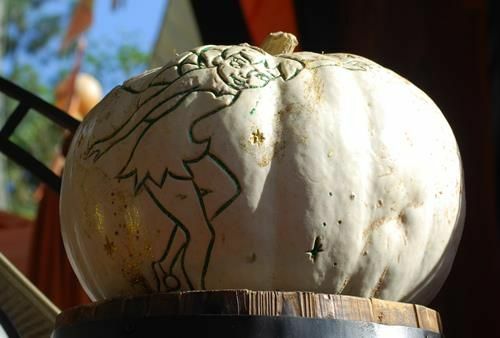 And on the back of the float was Miss Piggy and Kermit pumpkin. 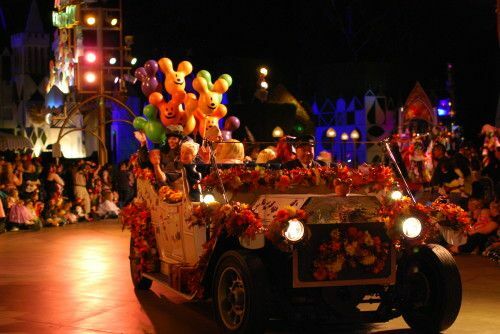 Overall, the Cavalcade seemed pretty similar from last year. 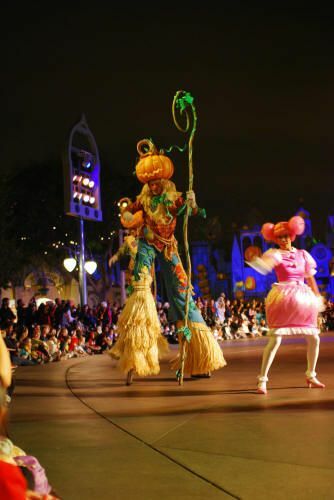 The stilt walkers might have been new, but the floats and Mickey pumpkins were the same. 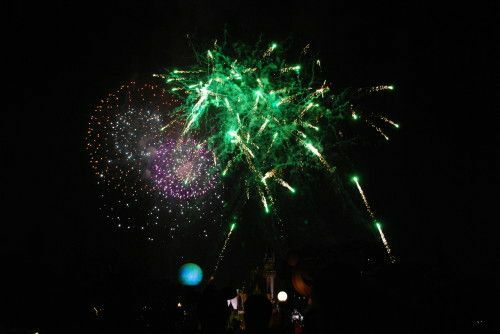 I still really like the Cavalcade and watched it all four times! 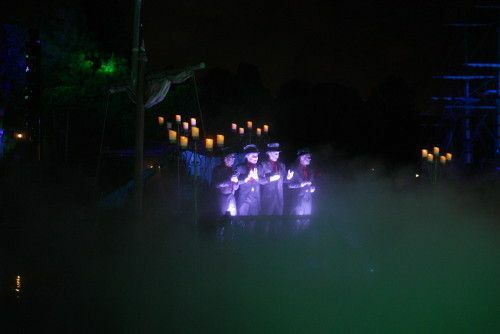 The Cadaver Dans perform on the Rivers of America at set times during the evening. 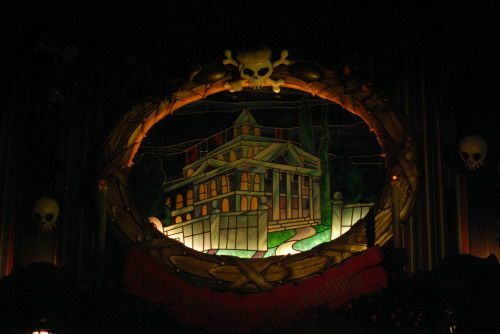 They're on one of the "rafts" and kind of start over by the PotC and then drift/motor towards the Golden Horseshoe and then back. 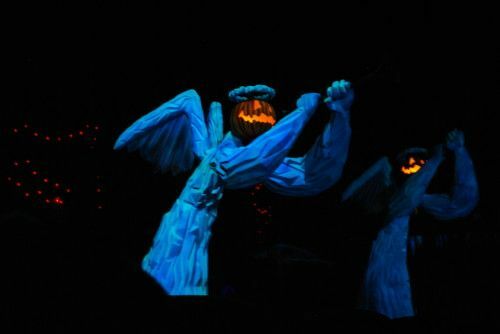 They sing a set of songs (about 15-minutes, I think) with Halloween themes. 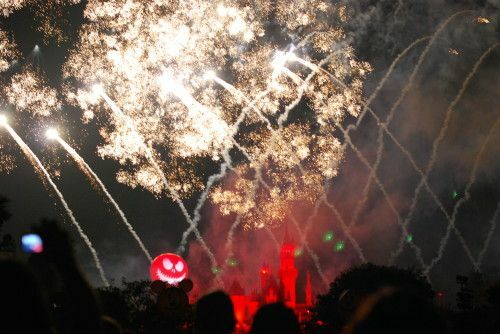 They open and close with "This is Halloween" (which I think is Disney's "go to" Halloween song because it's in the fireworks and Mad T uses it too!). 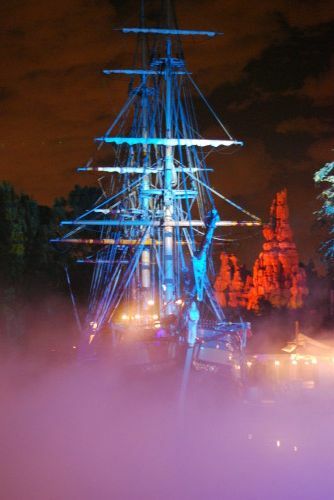 The dry ice makes for a very cool effect for both the Cadaver Dans and the Columbia, which is docked by the Pirates meet and greet. 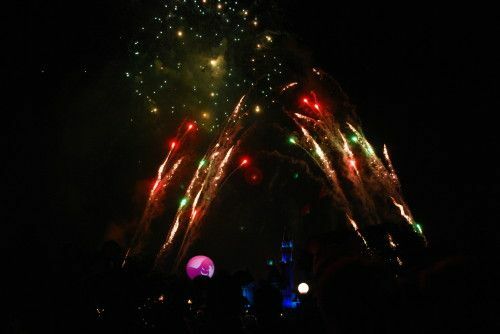 And then there are the fireworks! 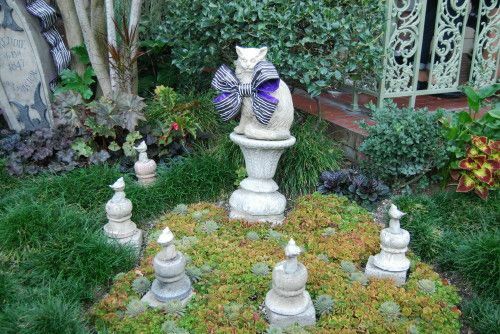 These are among my favorites, primarily because Zero flies! 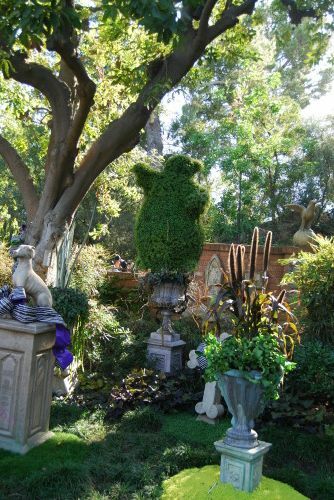 It's harder and harder to find a good, non-hub spot because of the trees on both sides of the Partner Statue area. 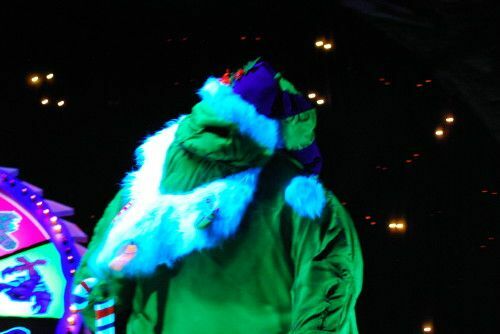 Those really can affect your ability to see the show. 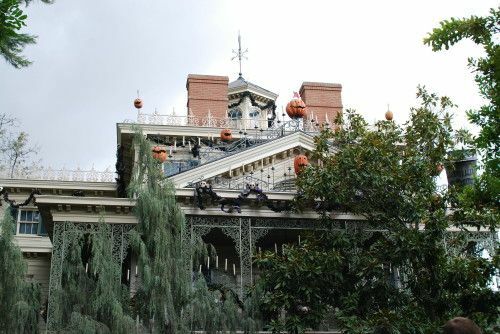 For Halloween Screams, make sure you can see the left side of the castle (when facing it) because that's where the ball appears. 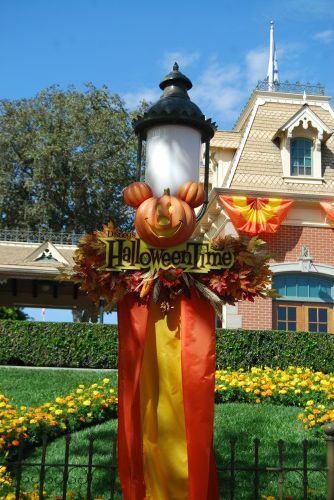 You'll start to see Halloween decorations as soon as you enter into Disneyland. 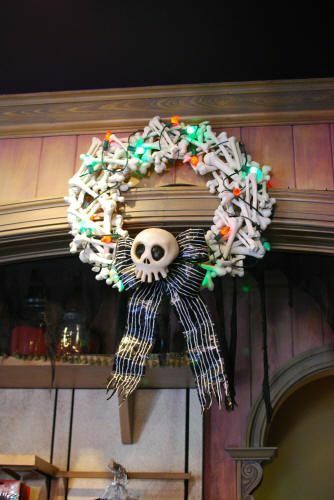 Many of the decorations are up during the day, but there are some party specific effects. 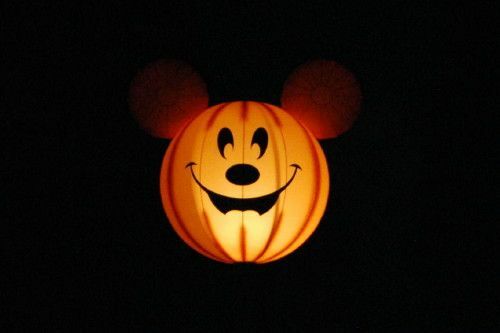 Among my favorites are the Ghost Mickey "balloons"! 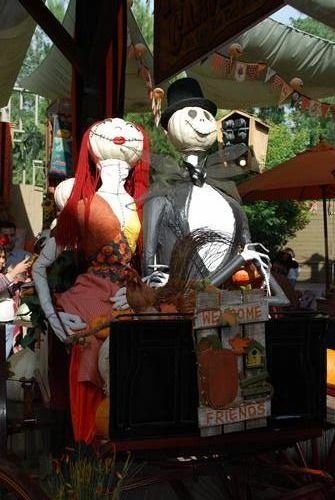 Before the party starts, they're up, but not inflated. 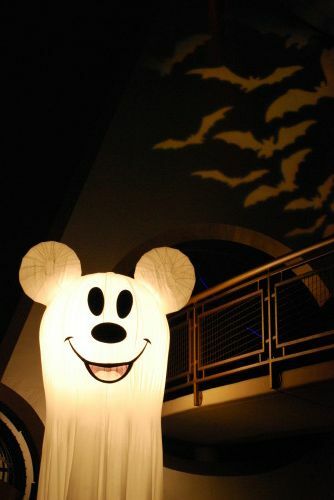 Once the party starts, they're inflated and lit up! 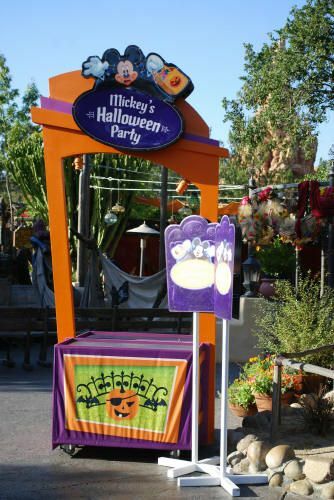 As the party set-up continues, you'll start to see the treat stations appear. I didn't notice initially, but the sides of the stations varied. 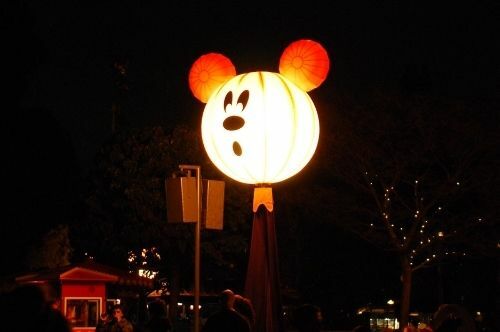 Located around the Hub are the four Pumpkin Mickey balloons. 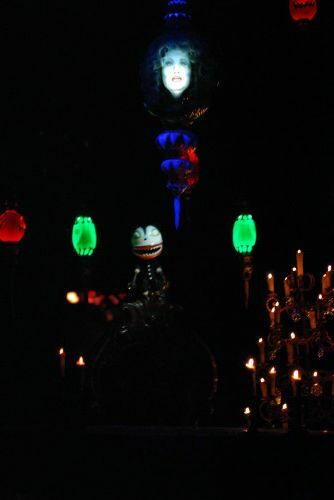 They have different faces and are also lit up! 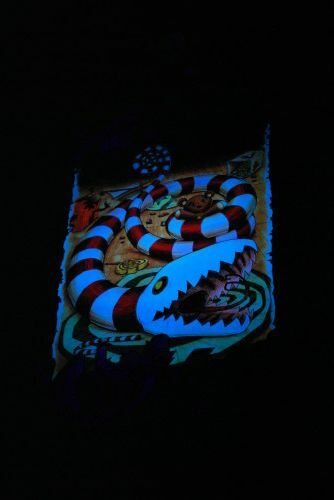 They also project images on sides of buildings and the ground. 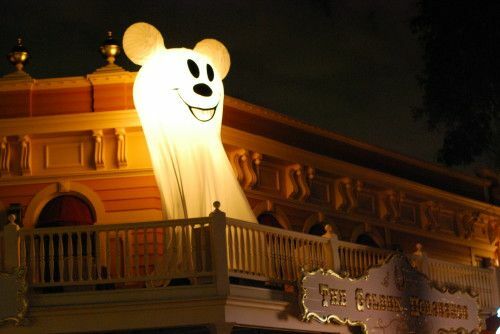 These were the ghosts on Main Street. 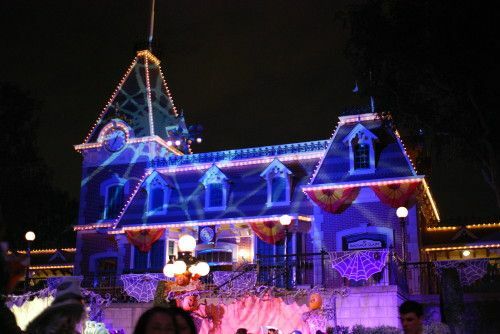 There was also a spider web! 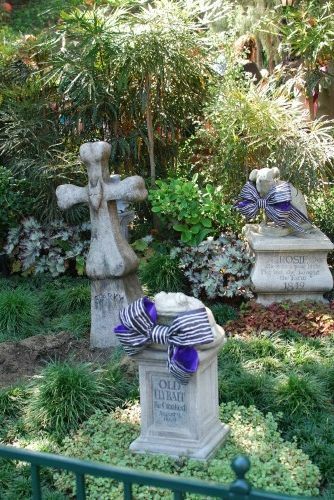 These were are on the ground on Small World Mall. 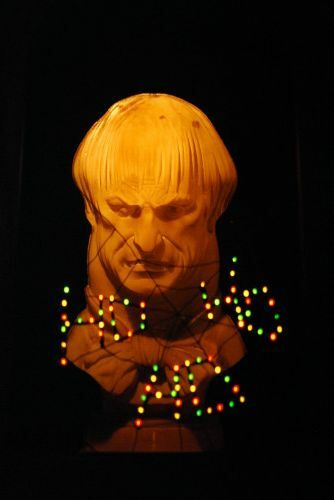 They also light up the Bradbury Tree! 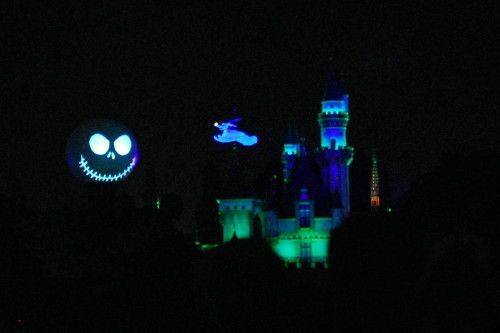 I like the way they light up the buildings. 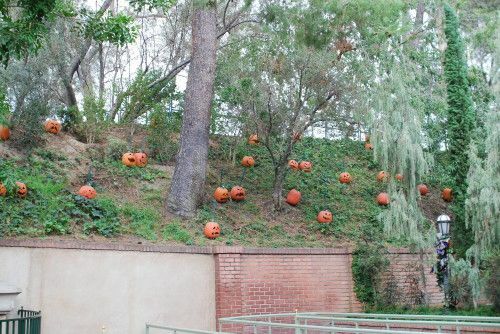 It really adds to the atmosphere! I almost forgot! 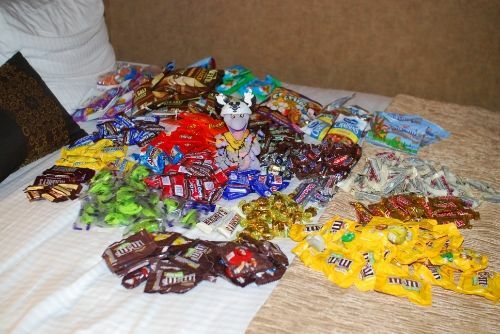 The candy! We (three adults) collected over 21 pounds of candy at the two parties. We collected 9.1 lbs on Tuesday and 12.2 lbs on Friday. 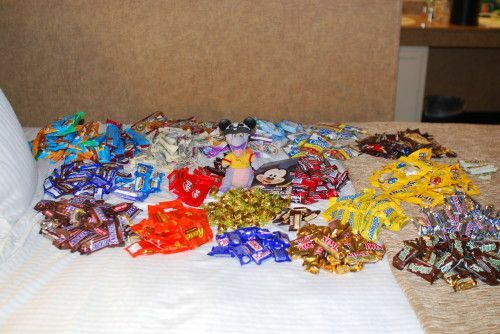 Candy included Reese's Cups, Kit Kats, Snickers, Milky Ways, Three Musketeers, Peanut Chews, M&Ms (regular and peanut), Almond Joys, Whoppers, and others. 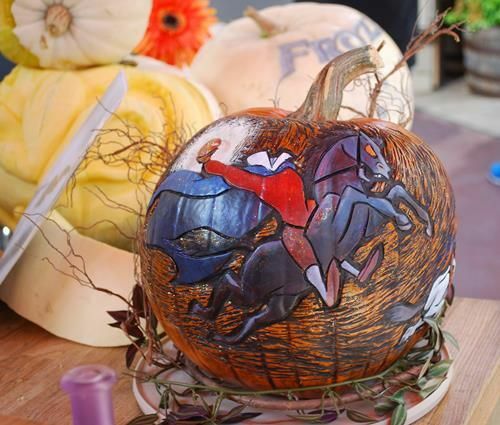 In addition, they were also handing out Kid Cliff Bars, Crasins, Graham crackers, apple slices, and carrots. 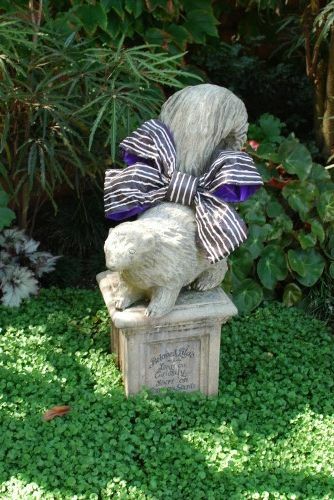 We collected about 6.6 lbs of these things. 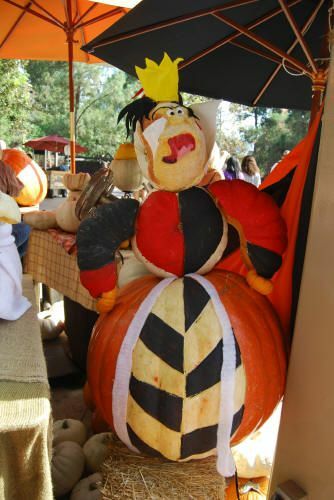 Big Thunder Carnival! 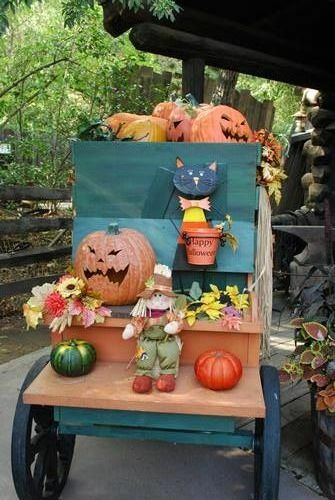 The Big Thunder Ranch area is set-up to resemble a Halloween carnival. 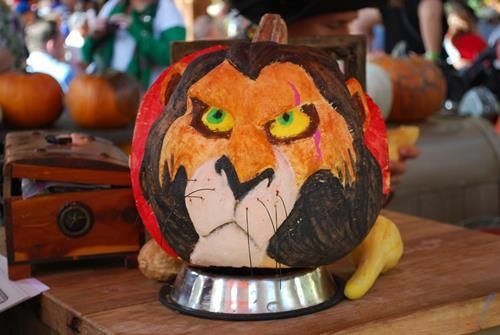 There are pumpkin carvers, some games (free), coloring stations, character meet and greets, snacks, and Pirates League. 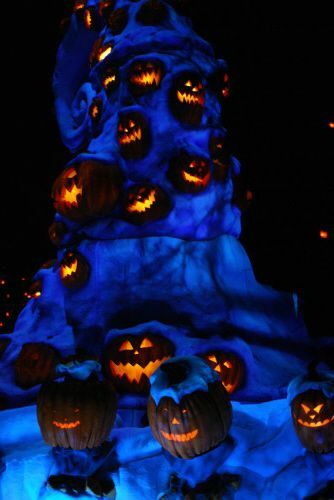 It's a fun area to explore and look around. 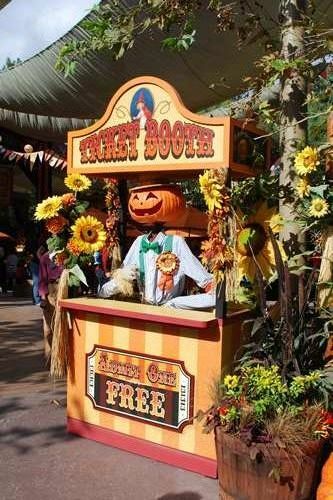 The "ticket" taker - it's free to enter! 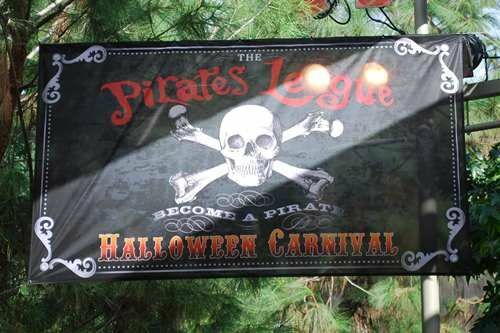 This is where Pirates League is set-up. There were also games! One was spin the wheel and the other was a ring toss. Both were free to play and the "prize" was a card with your fortune on it. 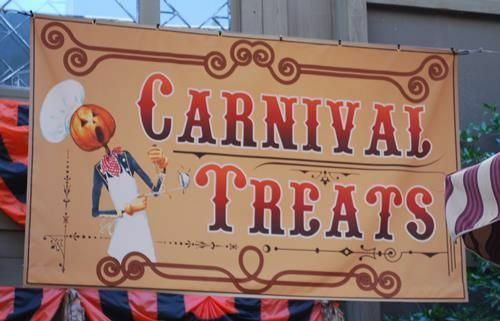 And then there were the Carnival treats! Lots of yummy things to try. 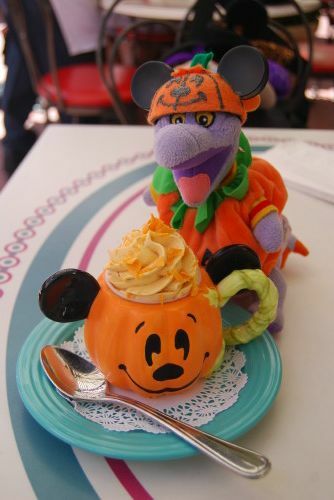 It's also worth noting that if you missed out on last year's Halloween mug (the one with Mickey & Minnie dancing with the Haunted Mansion ballroom ghosts), they have that over there with hot Apple Cider or Cocoa. 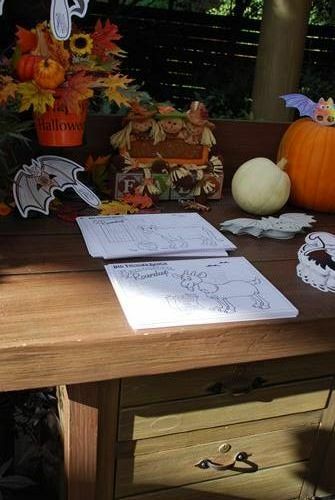 Guests had the option of coloring a picture or a paper mask. 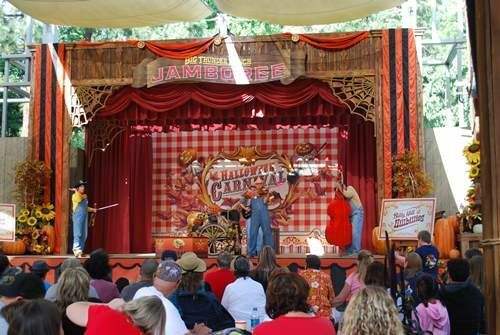 The Carnival is also where Billy Hill and the Hillbillies play. 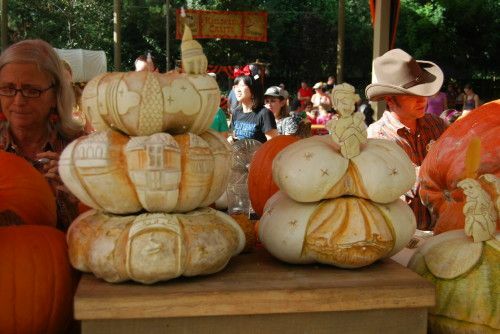 The pumpkins seemed to come in three types: 1) the ones that almost entirely painted, 2) the ones that were etched, and 3) the ones that were carved like sculptures. 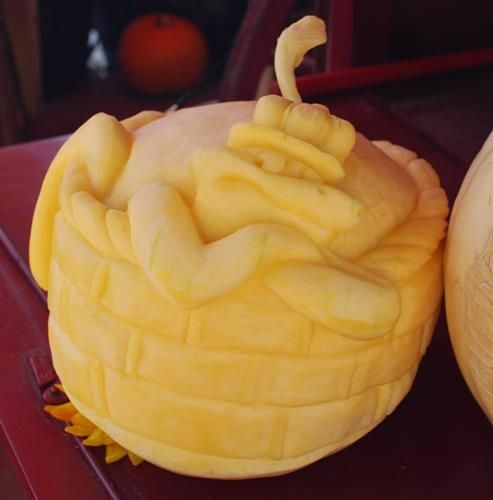 I didn't very many that were carved the way folks normally do it a home (e.g., Jack 'O Lantern). 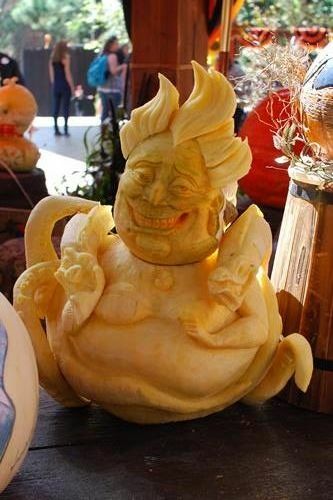 Some of the carved ones were really impressive. 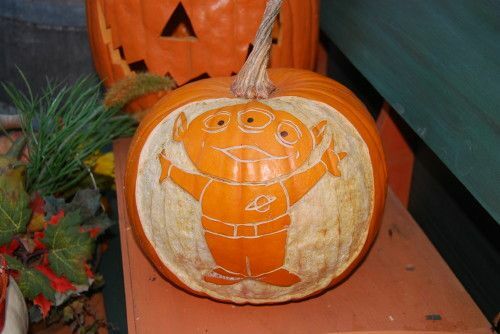 As was Minnie and the Toy Story Alien. 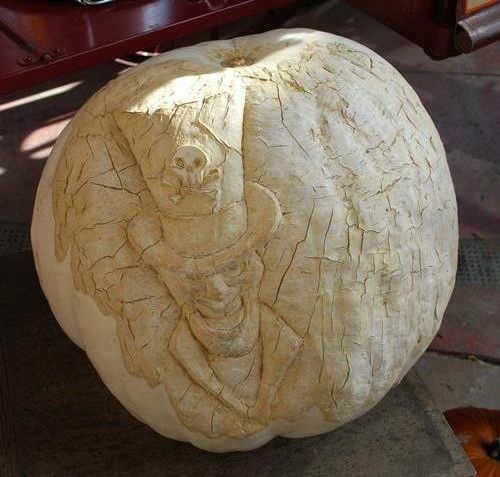 To me, the most impressive ones, were the sculpted ones. 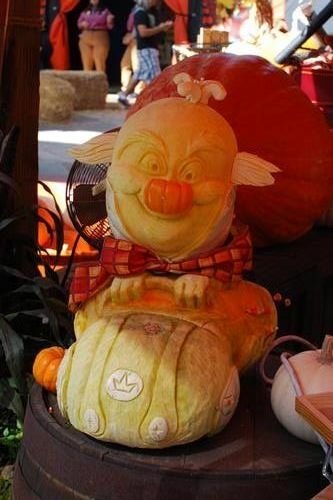 The carvers use a pumpkin as a base and then create a character from it. 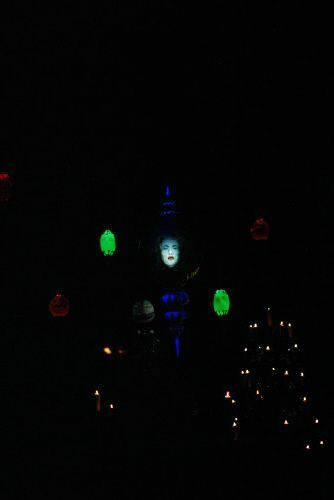 And then there was Ursula. 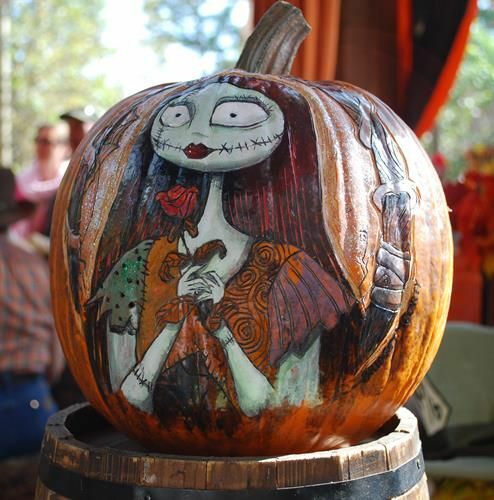 I saw her for the first time while the carver was sculpting one of the two eels. 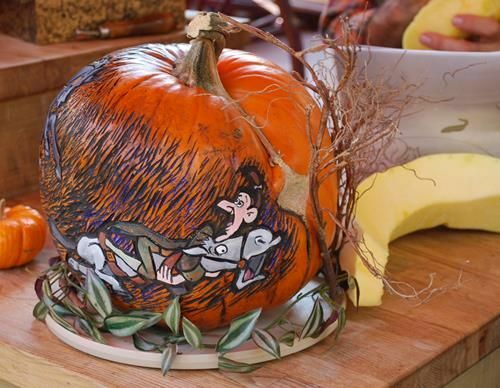 It was just a piece of pumpkin at that point (slightly curved rectangle). 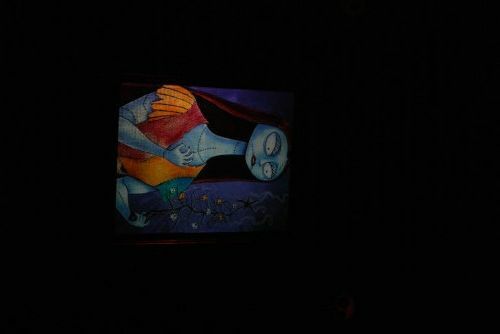 By the time I went back the next day, the eels had been finished and she was complete with sculpted hair. It was impressive! 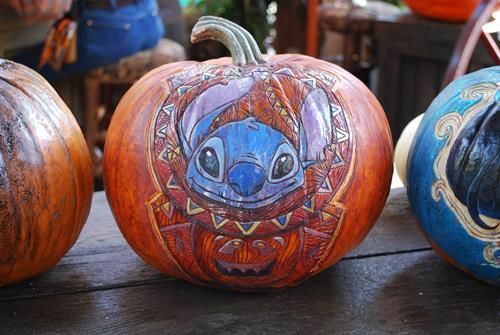 The pumpkins are works of art. 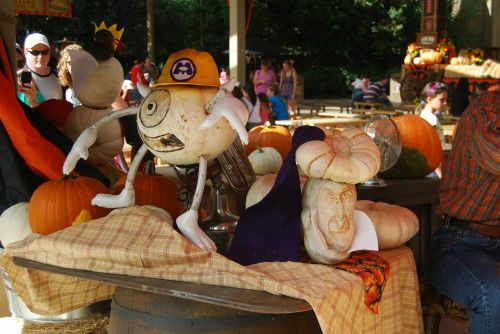 The pumpkins were really neat to see and it was fun to watch the carvers at work. The painted/etched ones lasted for quite a while (especially the painted ones), but the fully carved ones didn't last very long at all (maybe a week at most - I know some of the ones I saw at the start of the trip were gone by the end of the trip). 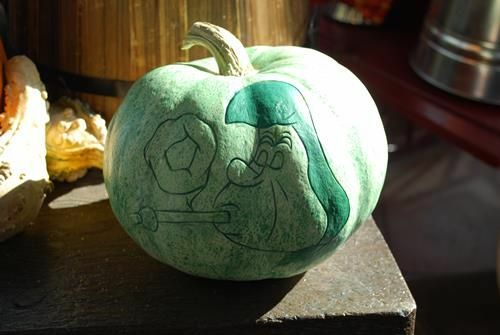 It's too bad that the carvers won't be back this year. It is really sad. 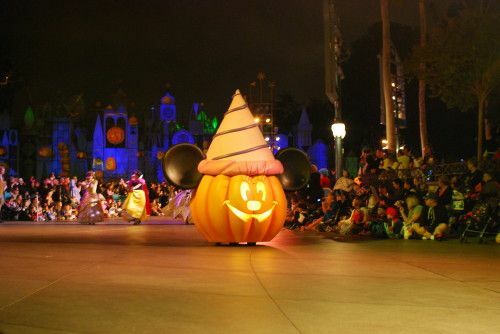 This is the first year I've been able to go during the Halloween season and I'm missing part of why I wanted to go. 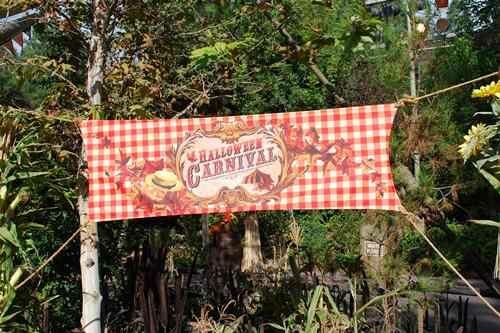 Yeah, I'm of kind of mixed emotions about the loss of the Carnival. 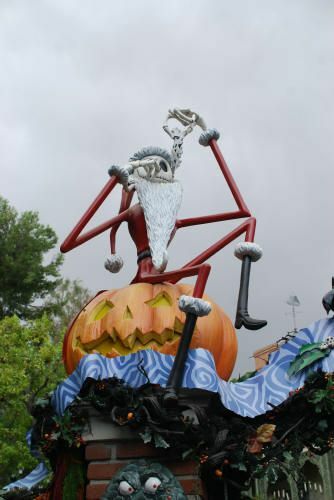 Some of the elements were very cool (e.g., the pumpkin carvers and seeing the characters in Halloween attire was neat), but a lot of the Carnival just seemed like it was just something DL did because they had the space. 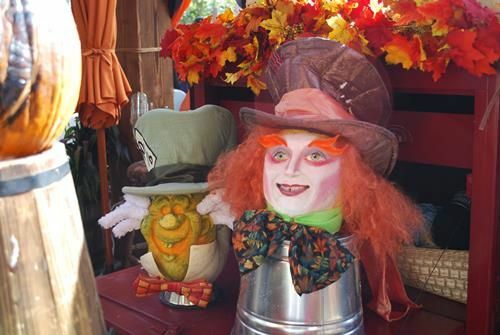 It's too bad they couldn't re-locate the carvers to somewhere else this year, but I'm not terribly surprised that the Carnival itself has been shelved. 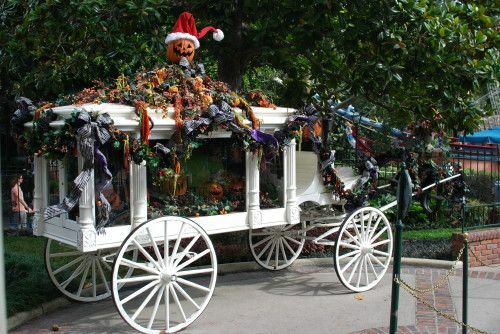 Haunted Mansion Holiday is one of those attractions that has grown on me over the years. 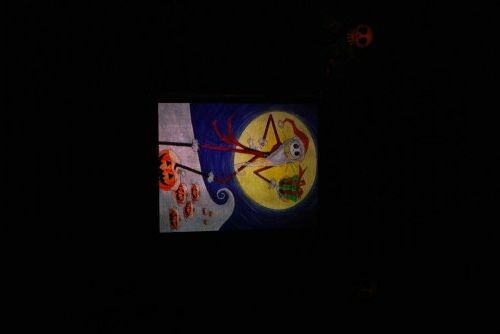 I'm not a big Nightmare Before Christmas fan, so I was originally disappointed that they added the overlay to the Haunted Mansion. While, I'm still not a big fan of the movie, I've come to like the overlay more and more. 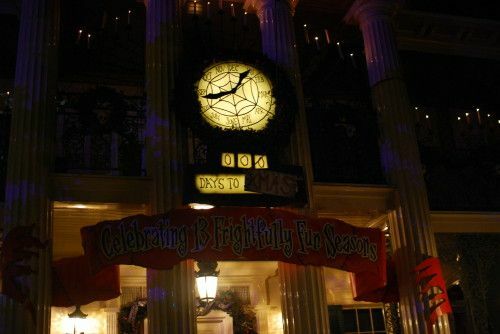 I'll admit that my favorite parts are always the Gingerbread House and seeing how many Zeros I can find. 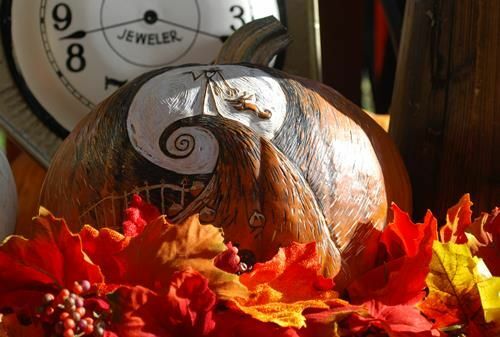 Many elements remain the same from year to year, while others change (often in very subtle ways). Outside - it was kind of gloomy one of the days I was there (okay, it drizzled and downpoured at different times), which lent itself to the atmosphere! 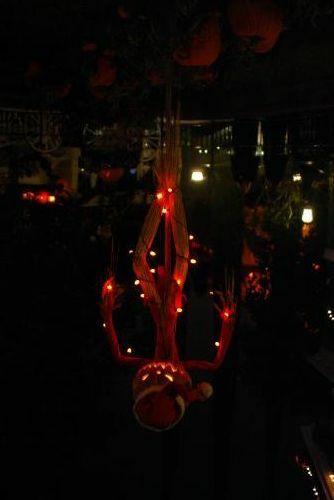 Some things looked creepier at night, while others things were very festive with their lights.